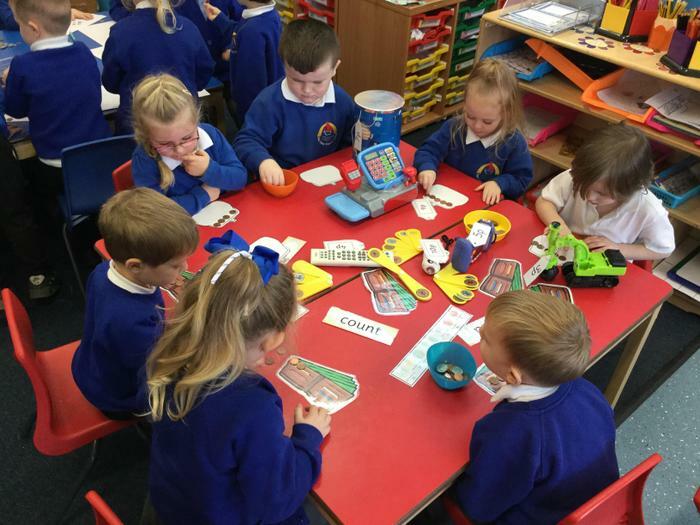 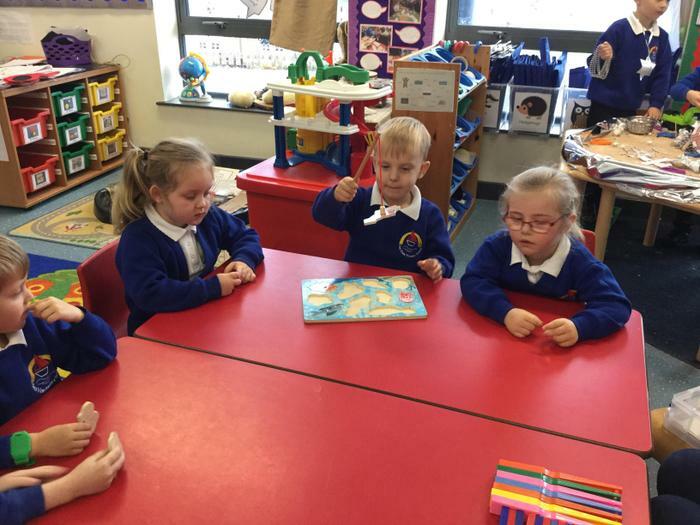 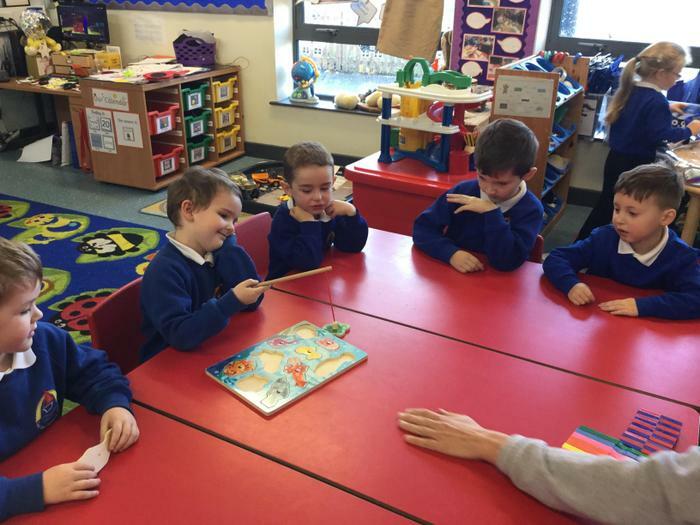 We have been learning about Easter and we have enjoyed drama and re-enacting Palm Sunday and looking at symbols of Easter, ordering events in the Easter story and sorting cards that are linked to Easter. 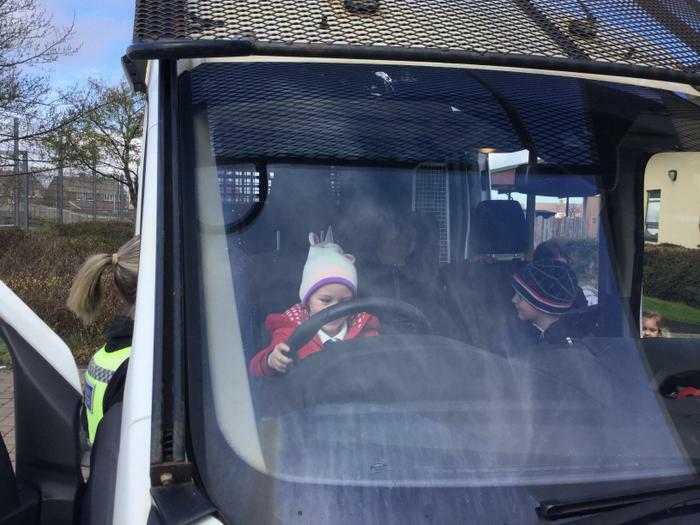 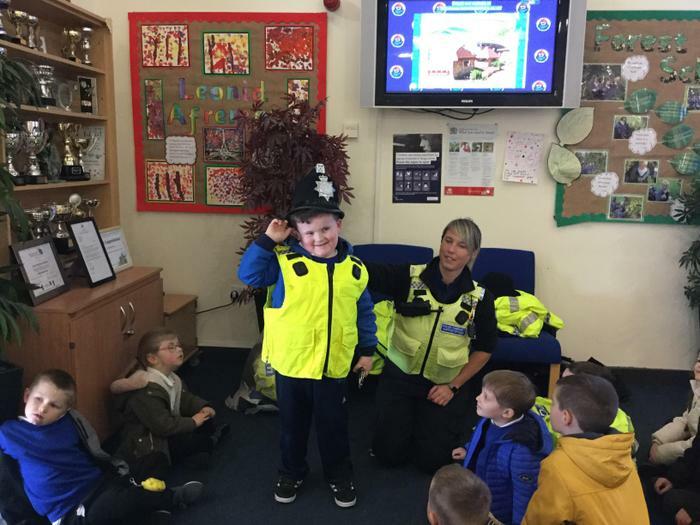 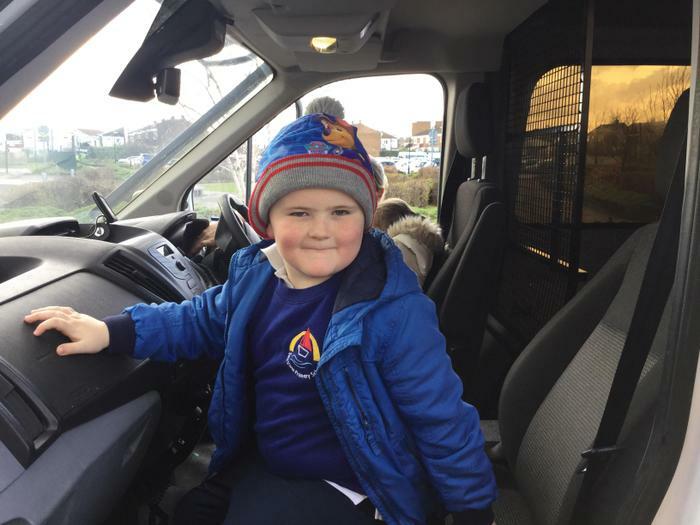 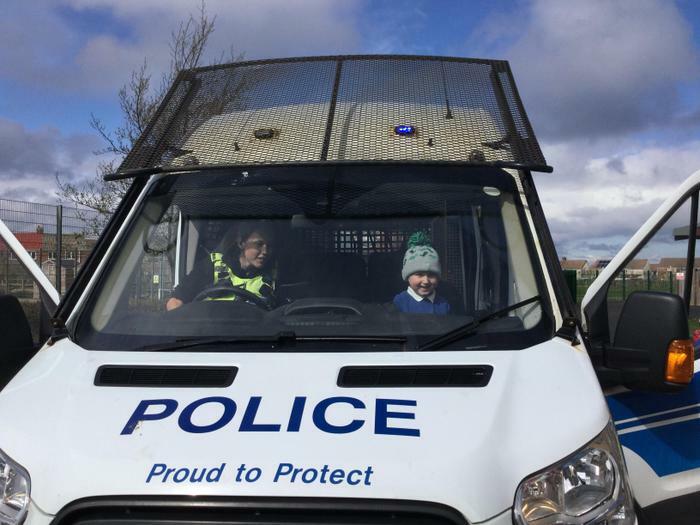 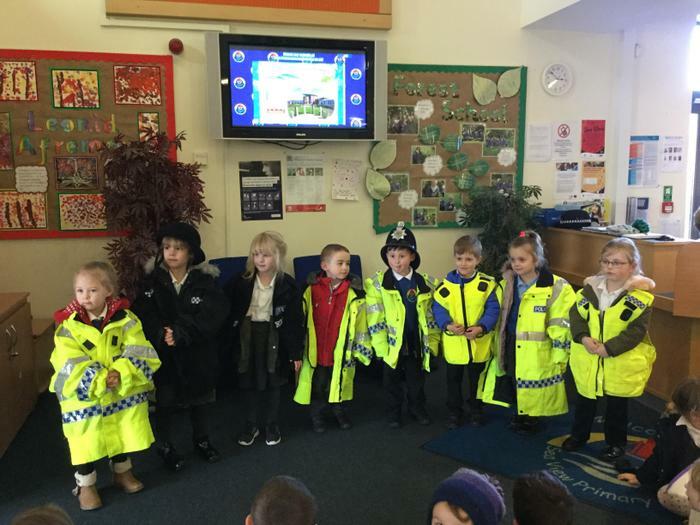 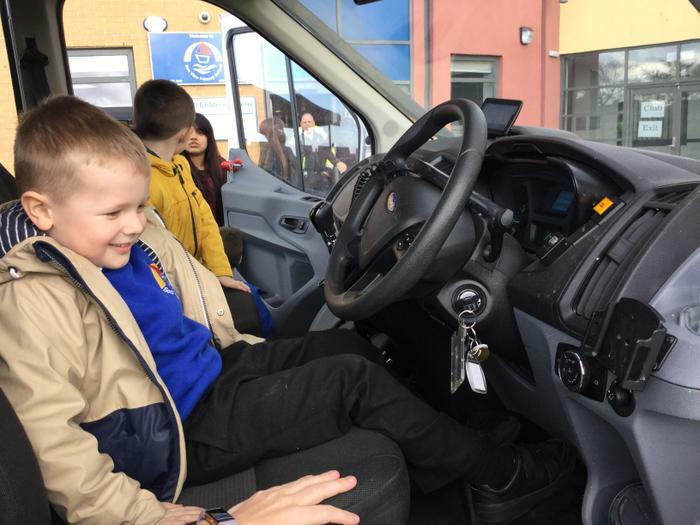 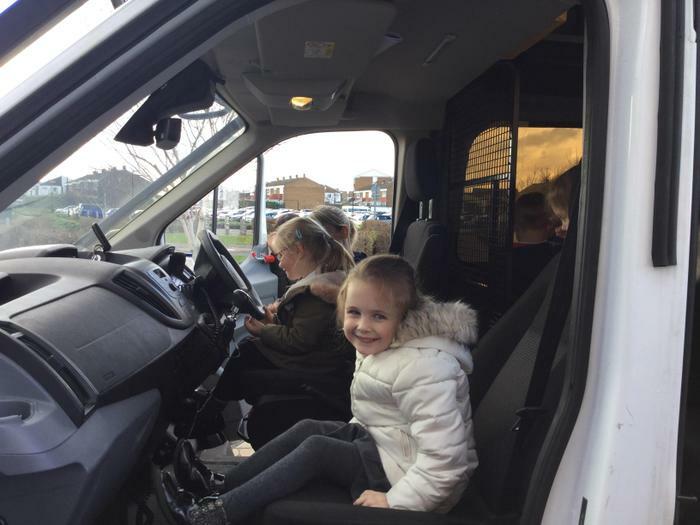 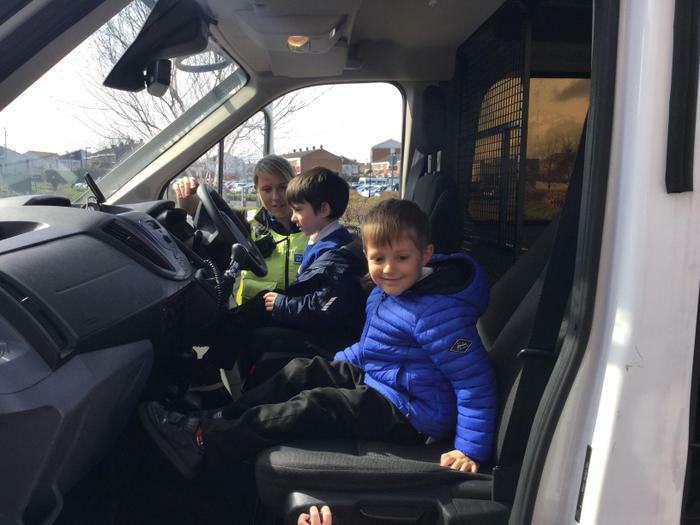 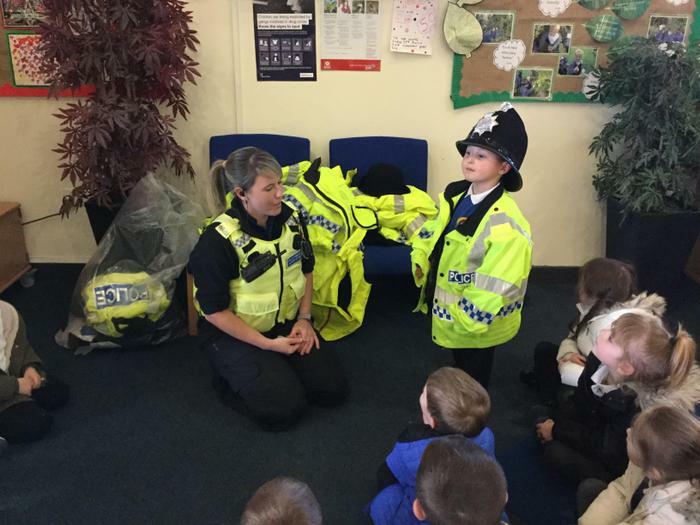 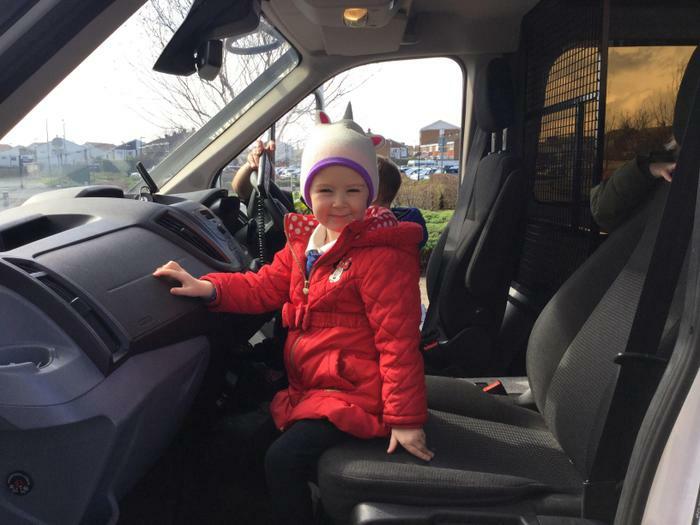 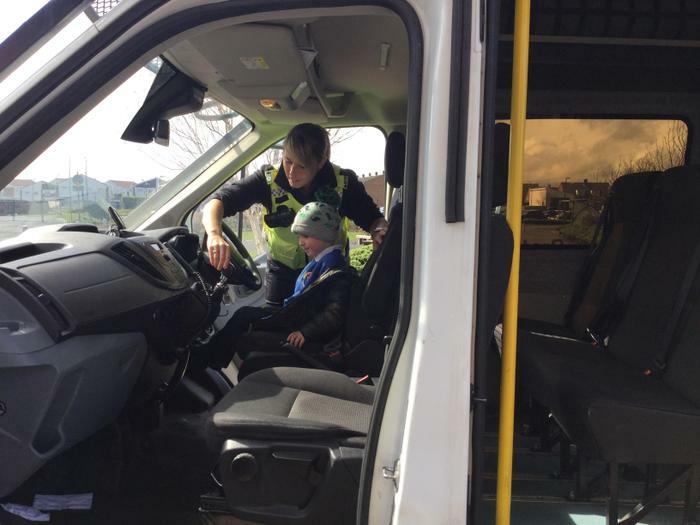 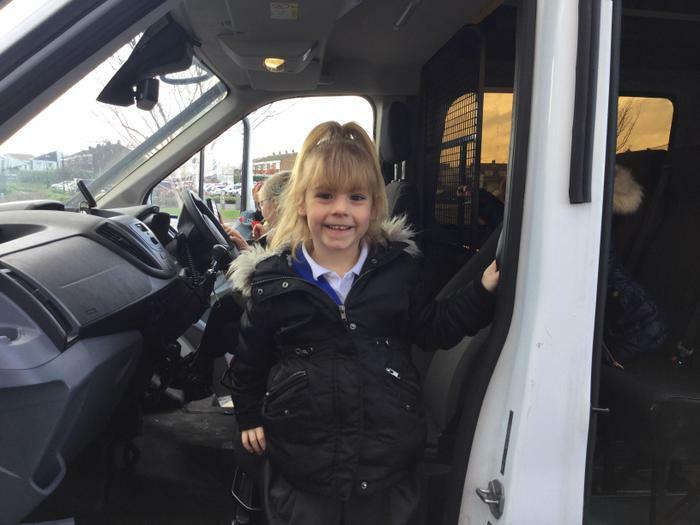 We had a visit from the police today and were lucky enough to have a look in their police van and tried on their uniform and even handcuffs! 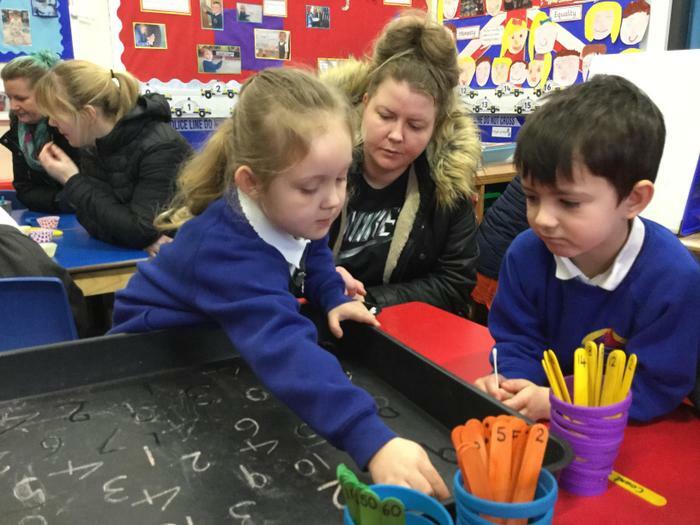 For science week we investigated floating and sinking using rubbish we find at the beach and then showed the rest of the school our results. 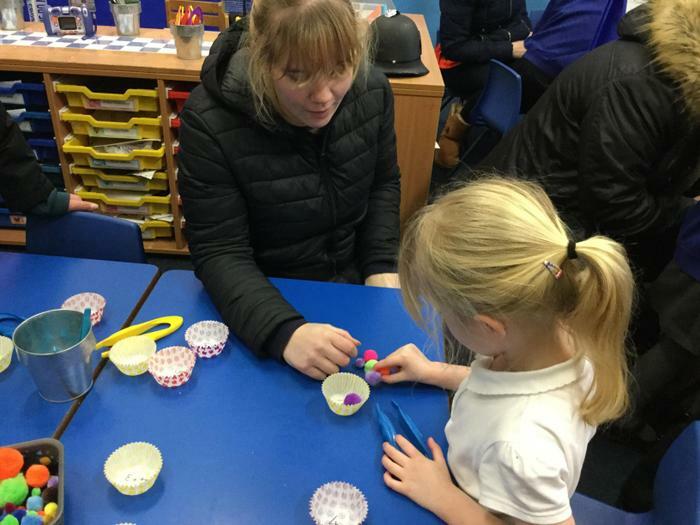 We also enjoyed finding out what other year groups learnt and listened as they shared their ideas at the science fayre. 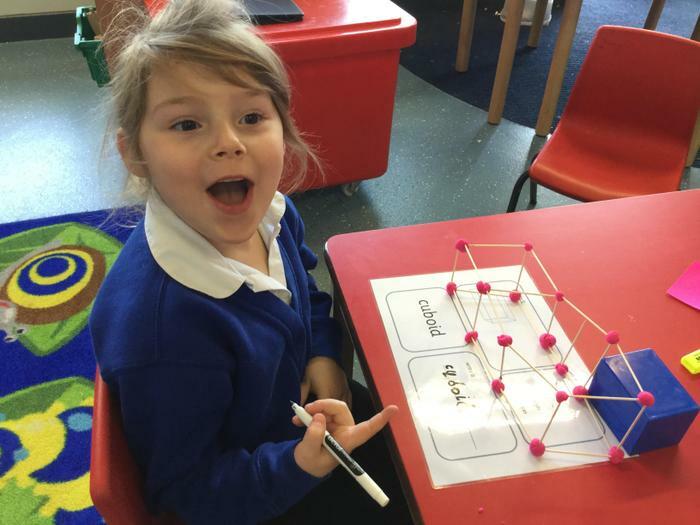 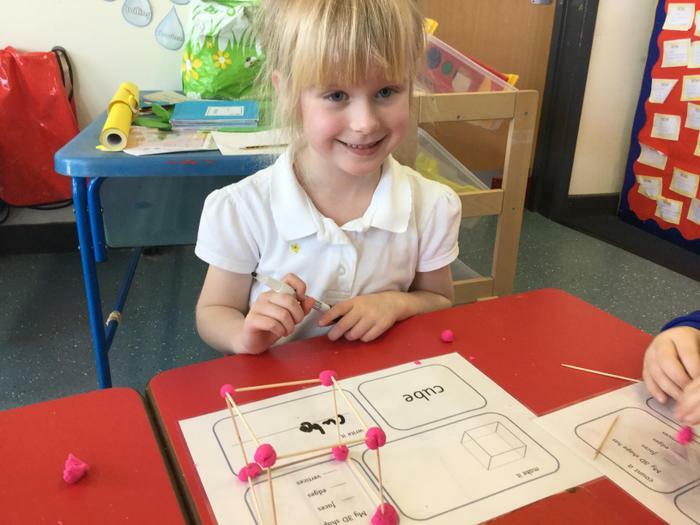 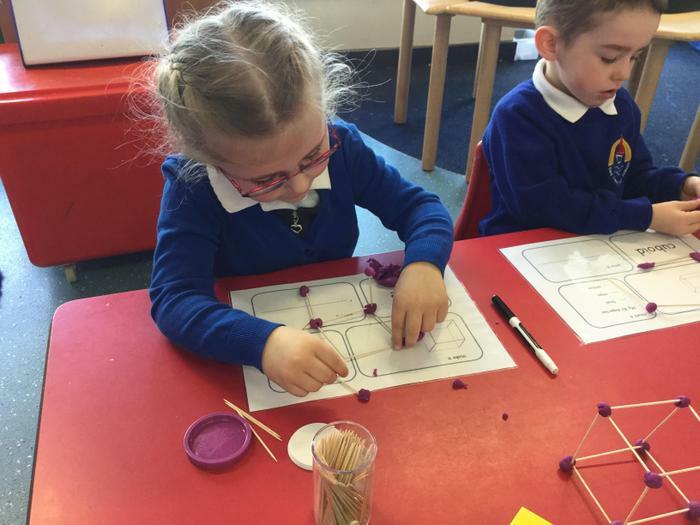 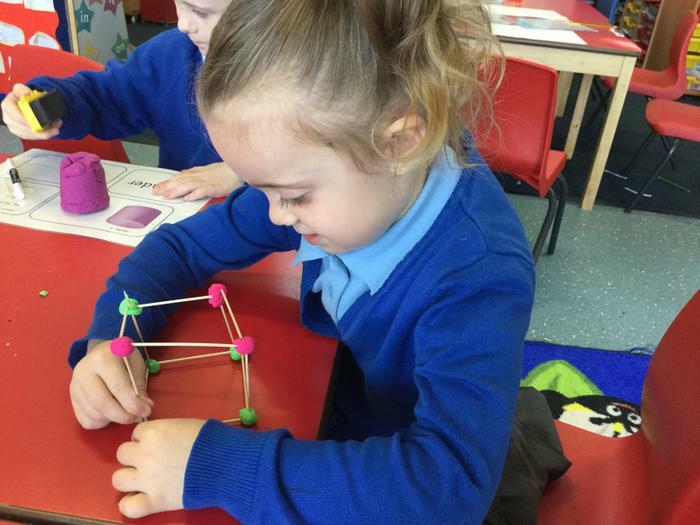 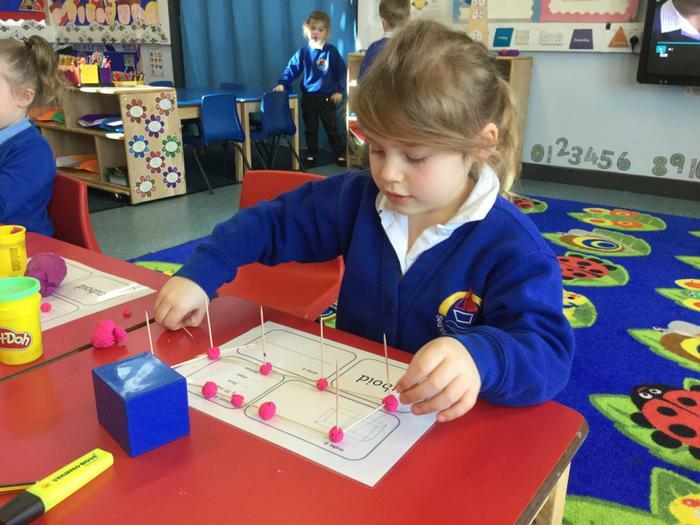 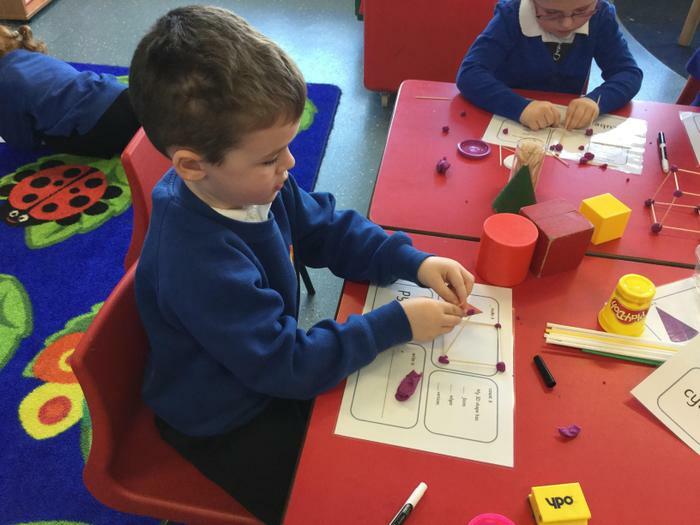 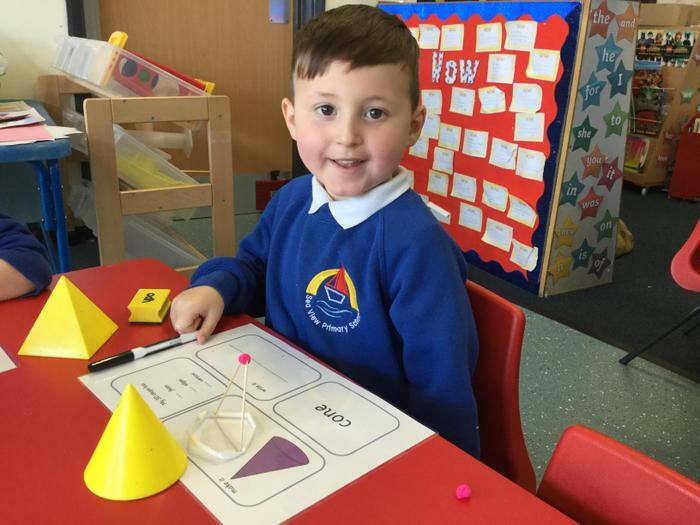 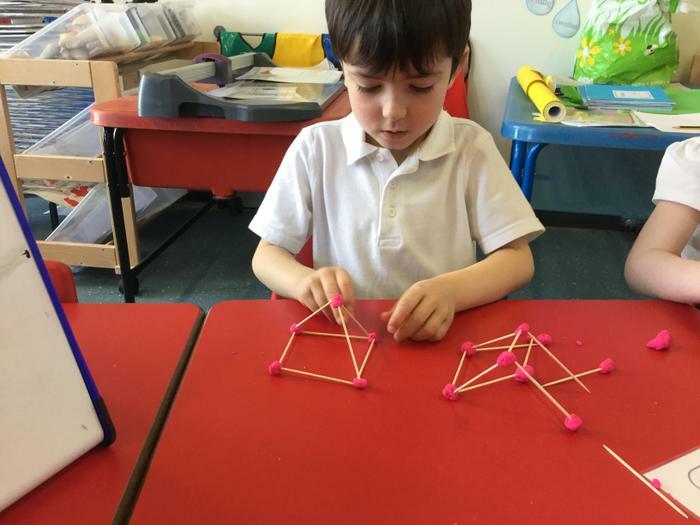 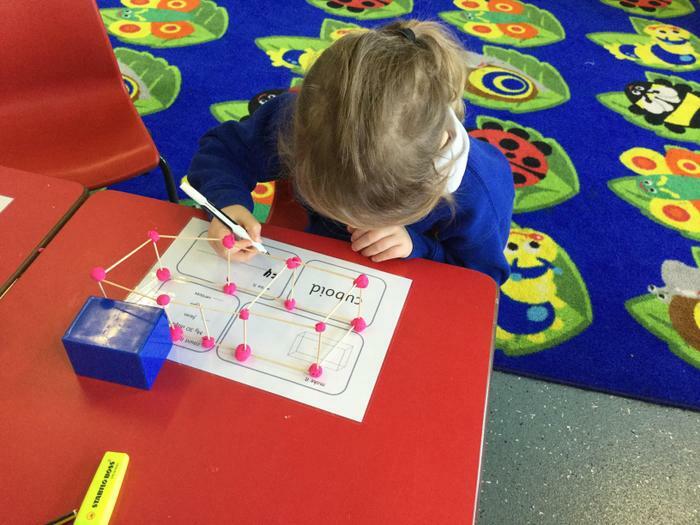 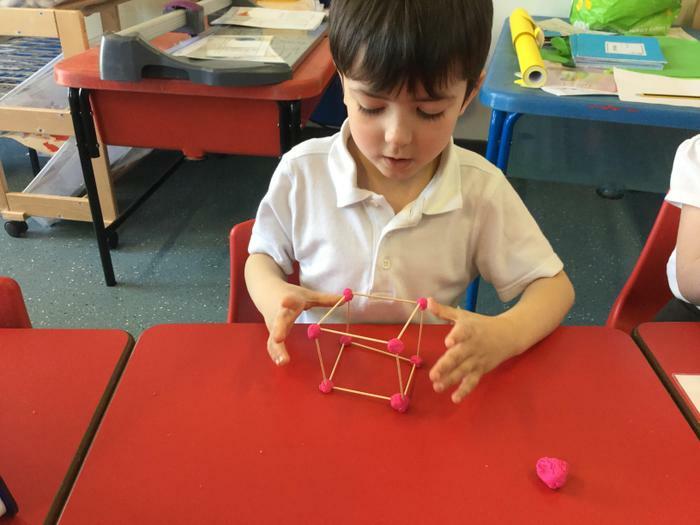 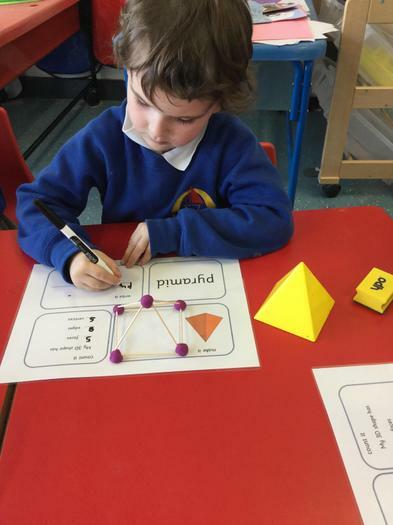 We have been making 3D shapes and talking about their properties. 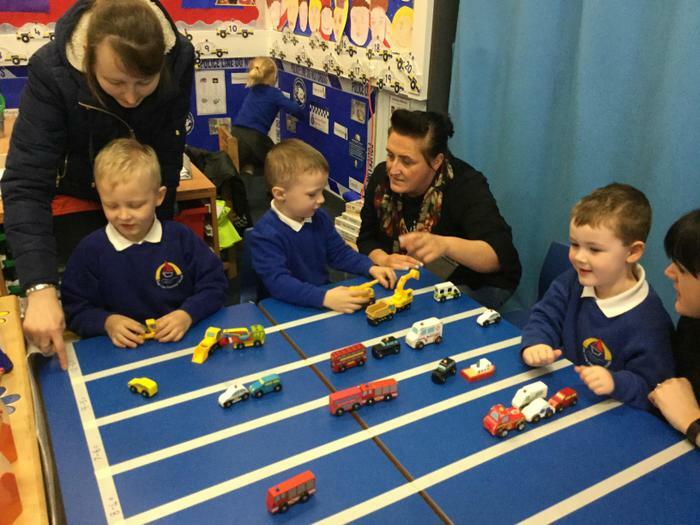 As part of our topic on ‘People who help us’ we had a visit from the fire brigade. 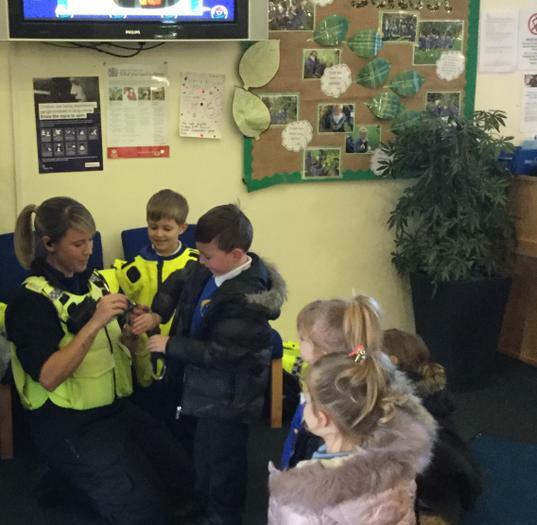 We got to use their hose that they use to put fires out. 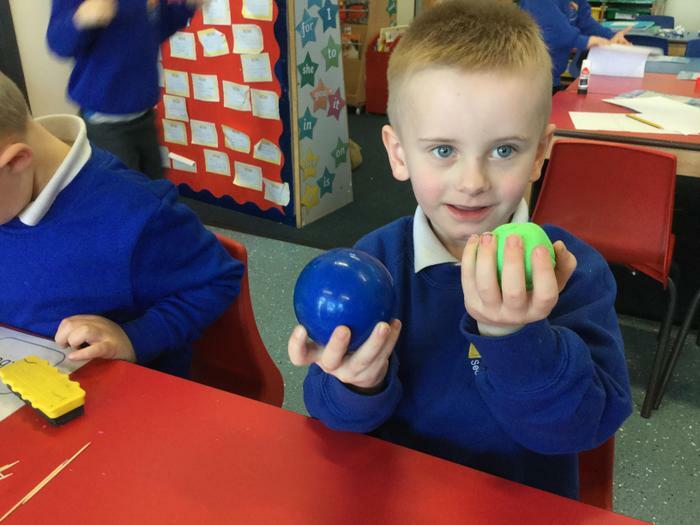 It was really heavy to hold! 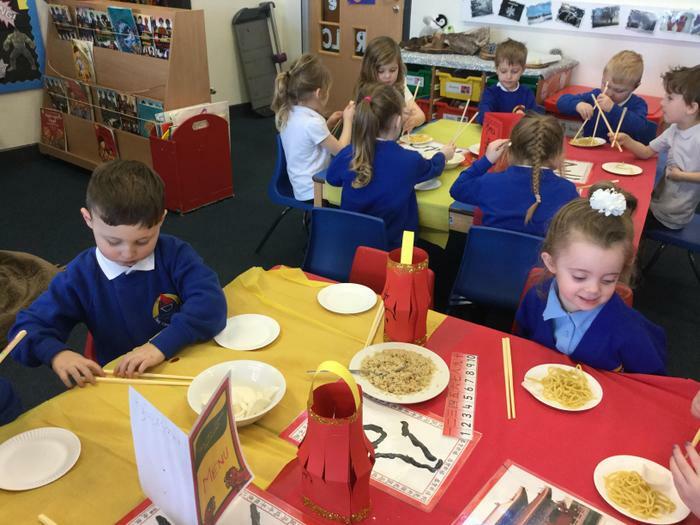 We made over 30 delicious pancakes today and measured out our ingredients and the best bit was eating them! 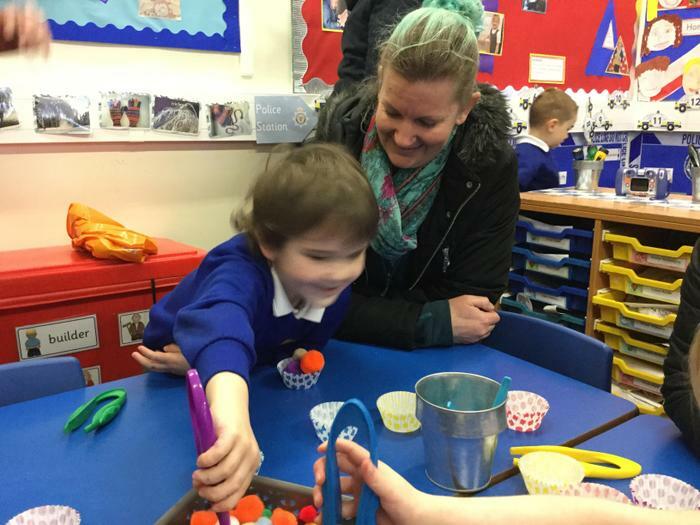 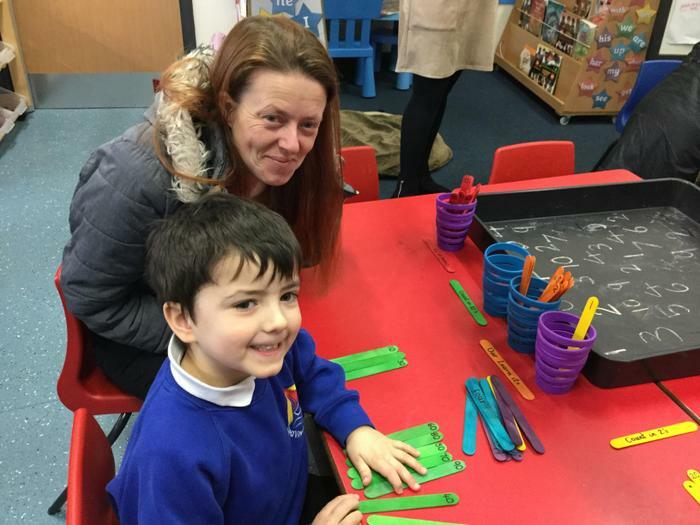 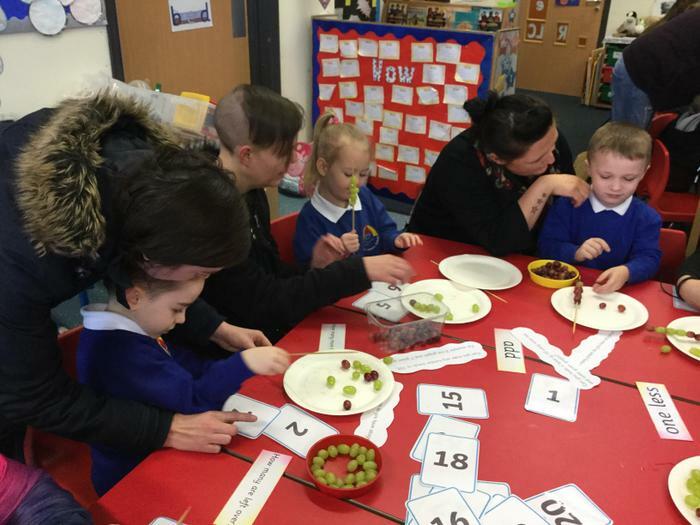 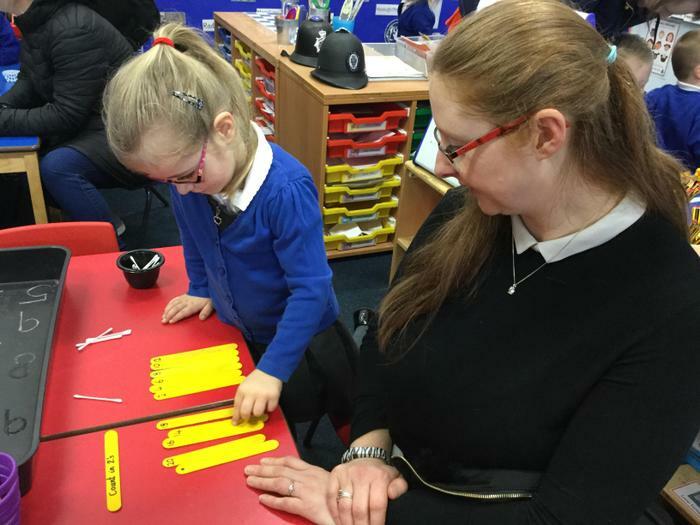 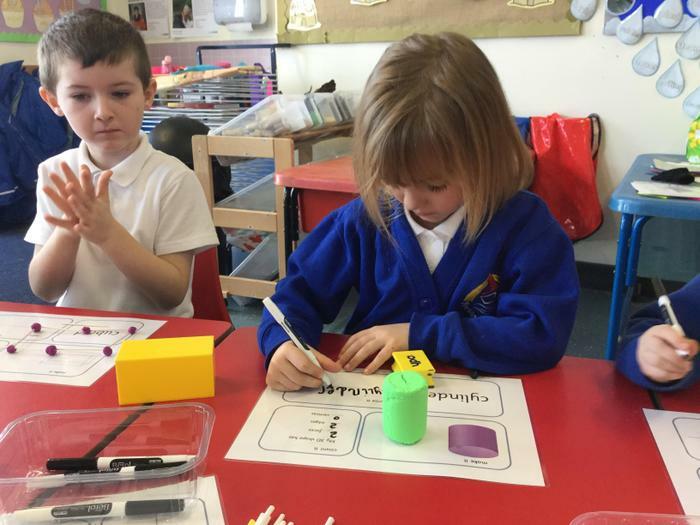 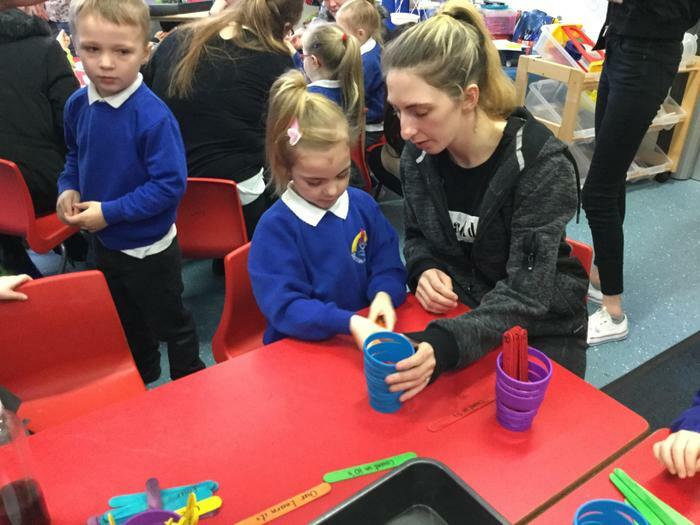 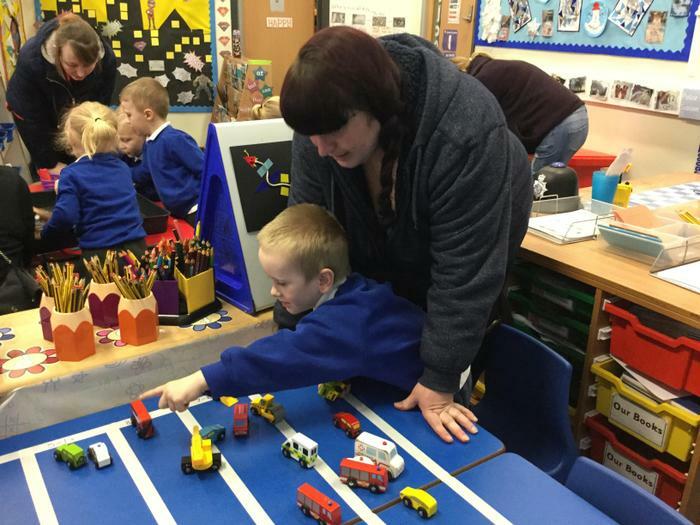 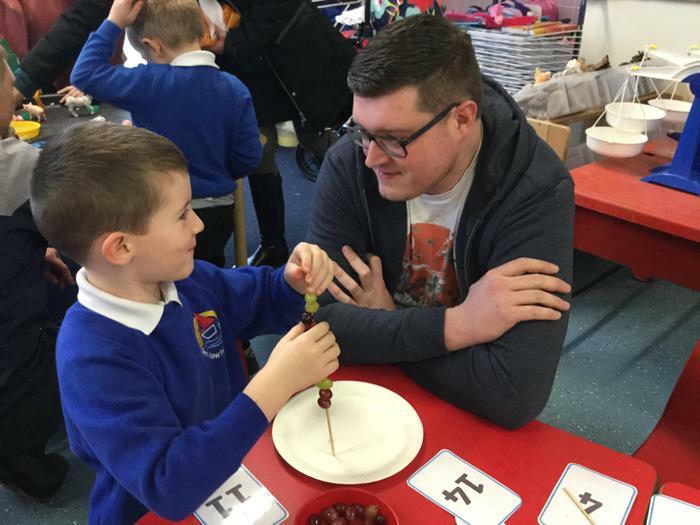 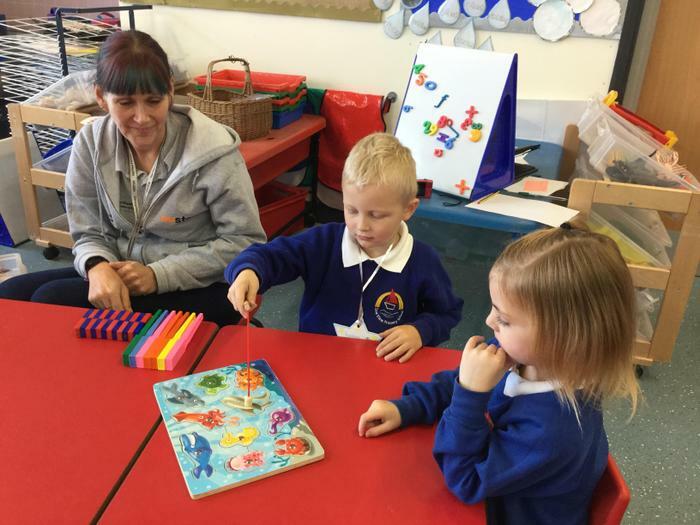 Our maths workshop was very successful and children loved having their grown up working on maths activities in class. 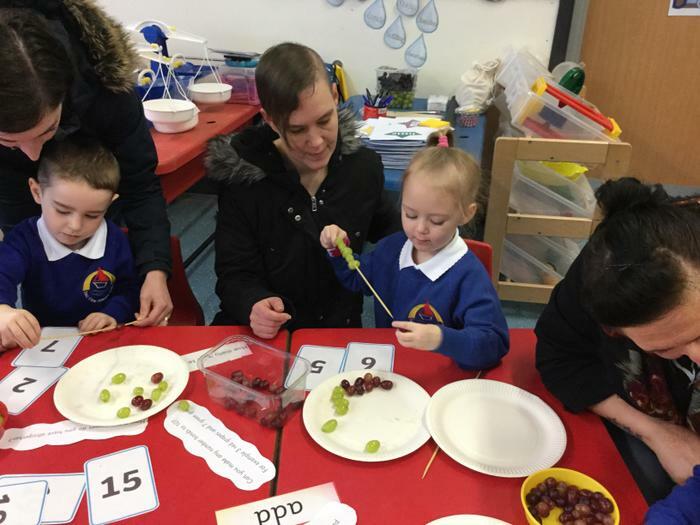 Thank you parents and carers! 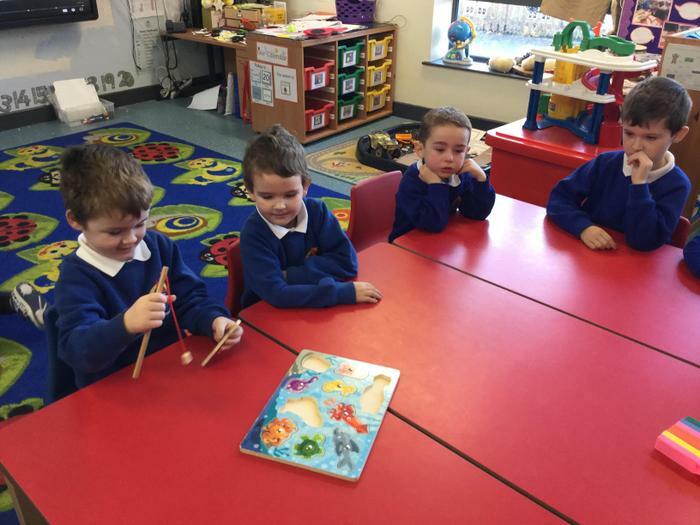 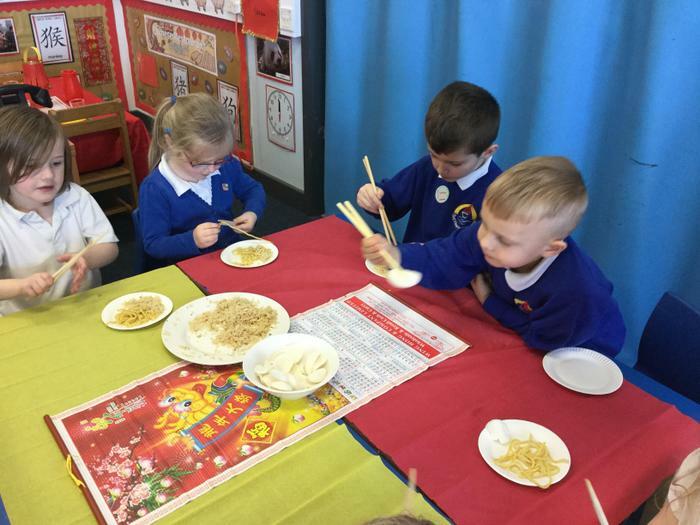 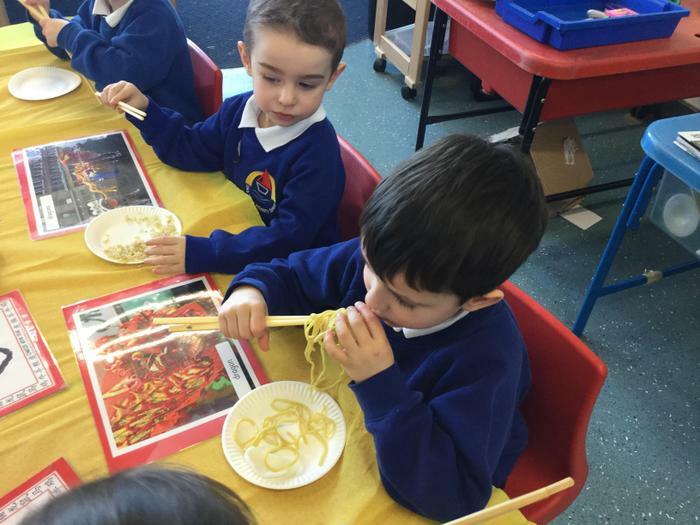 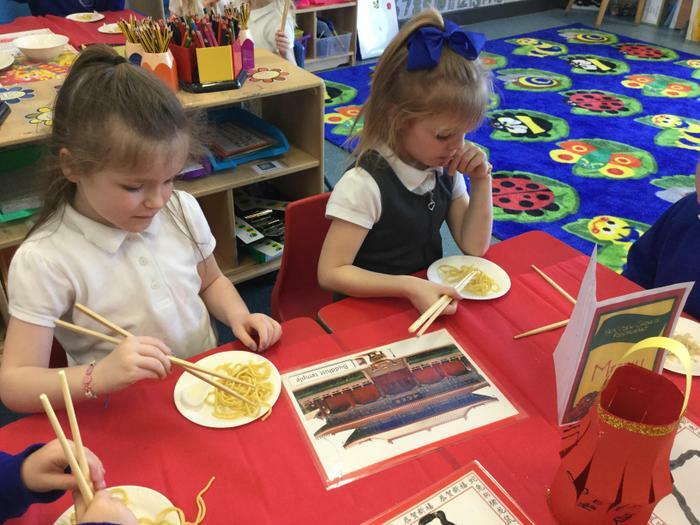 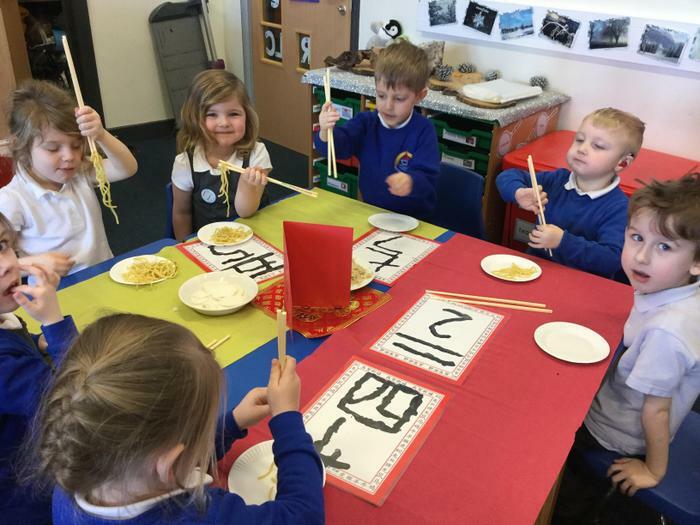 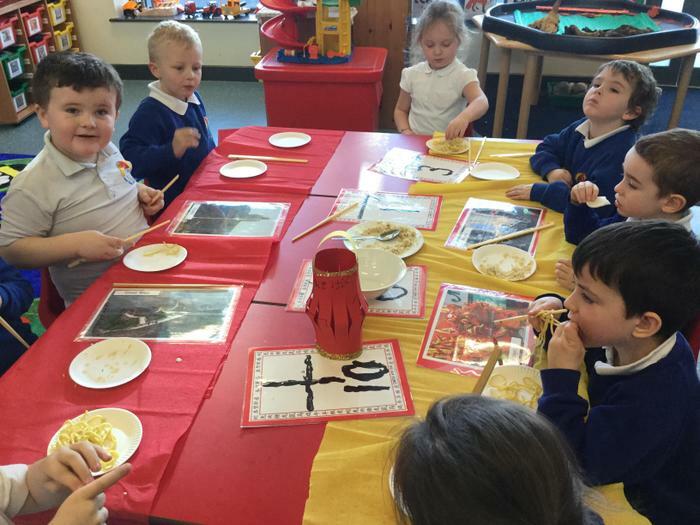 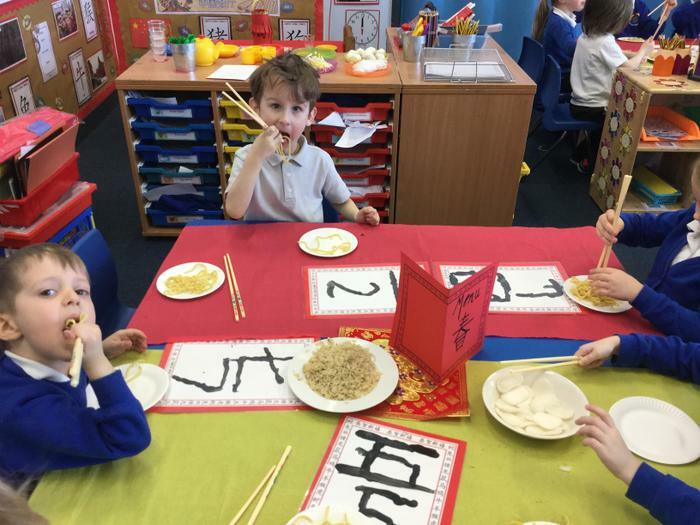 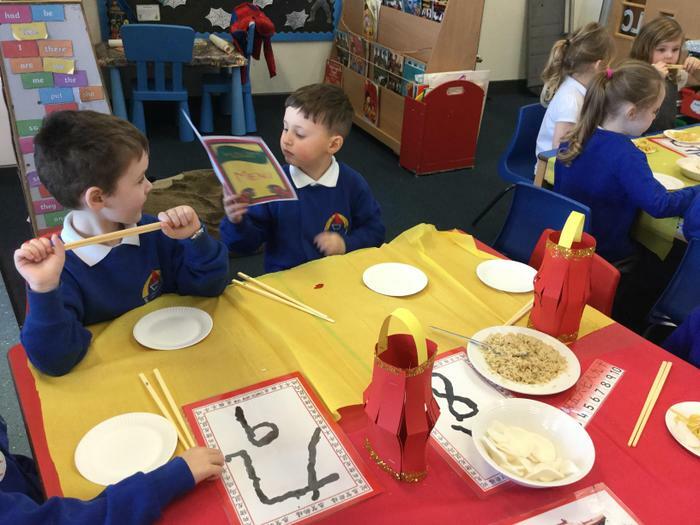 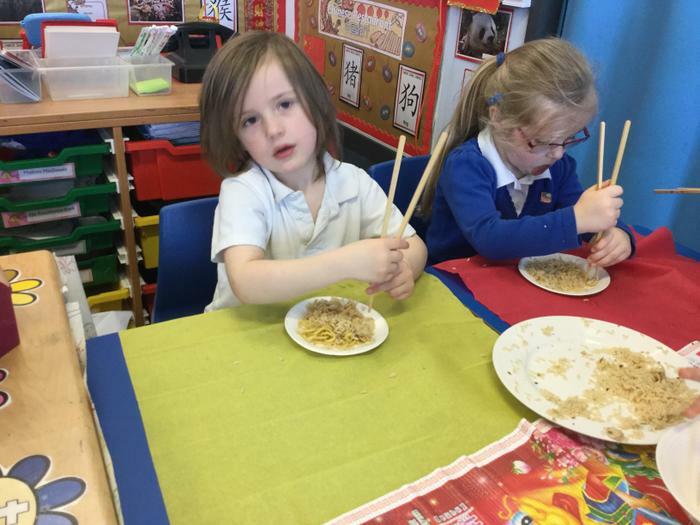 We are celebrating Chinese New Year by tasting noodles, rice and prawn crackers and using chopsticks! 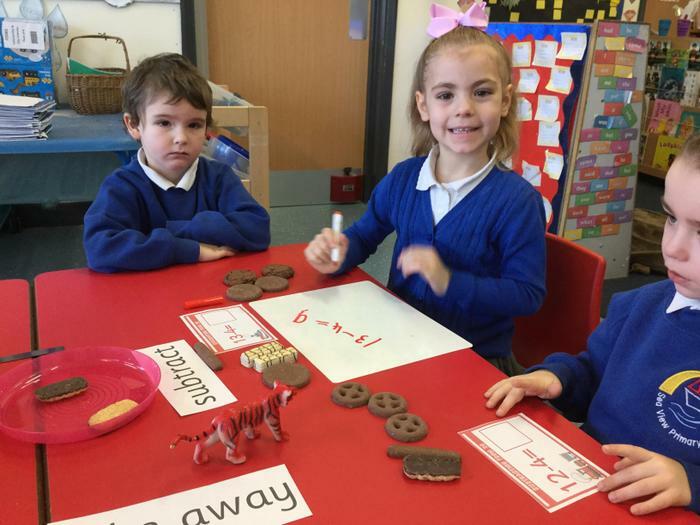 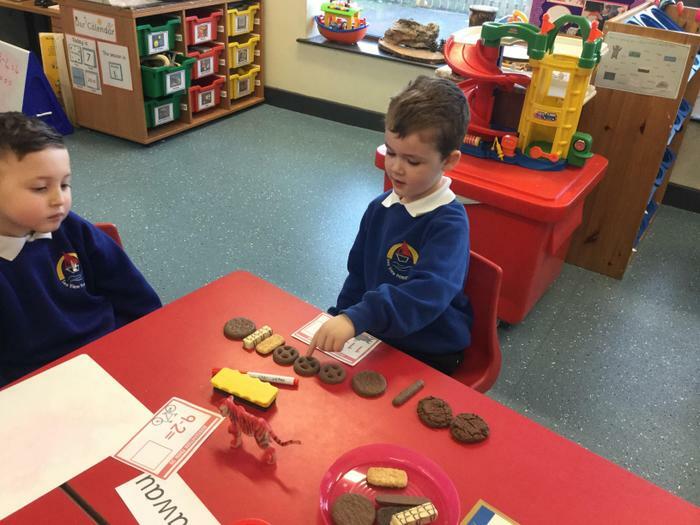 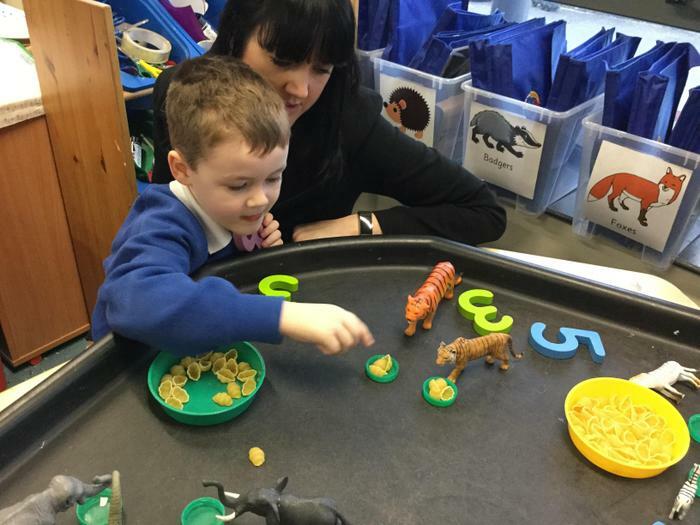 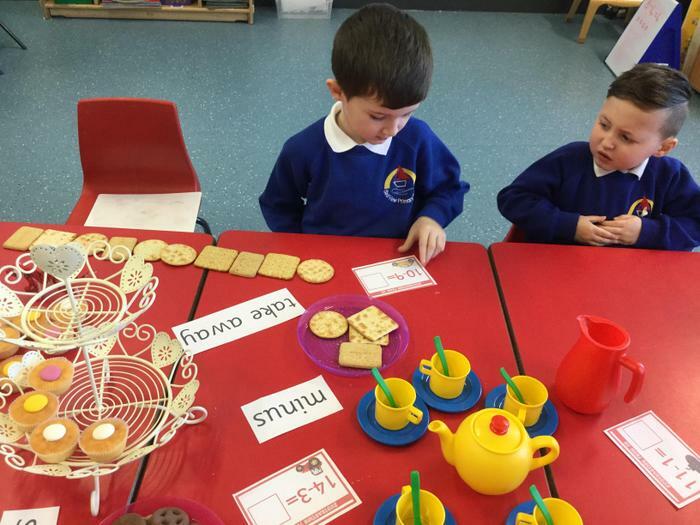 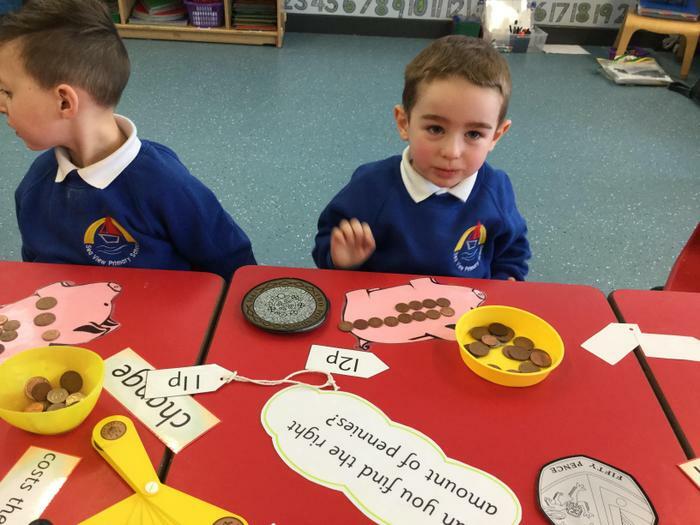 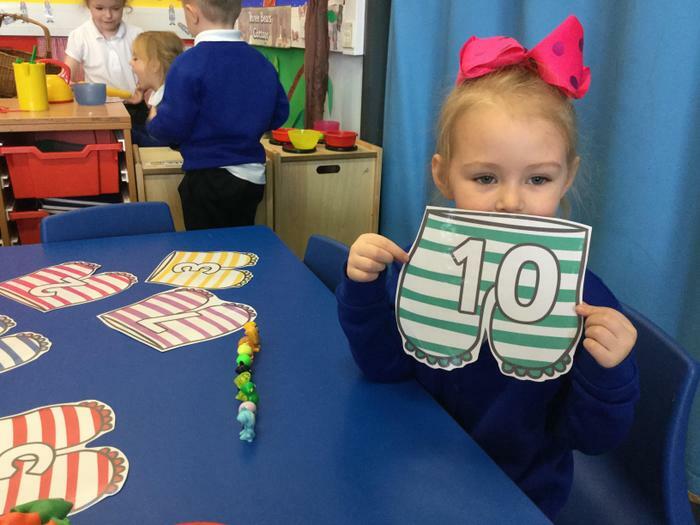 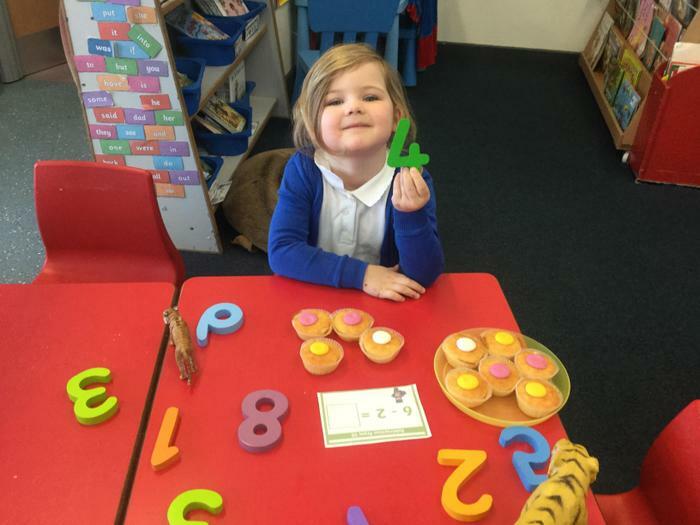 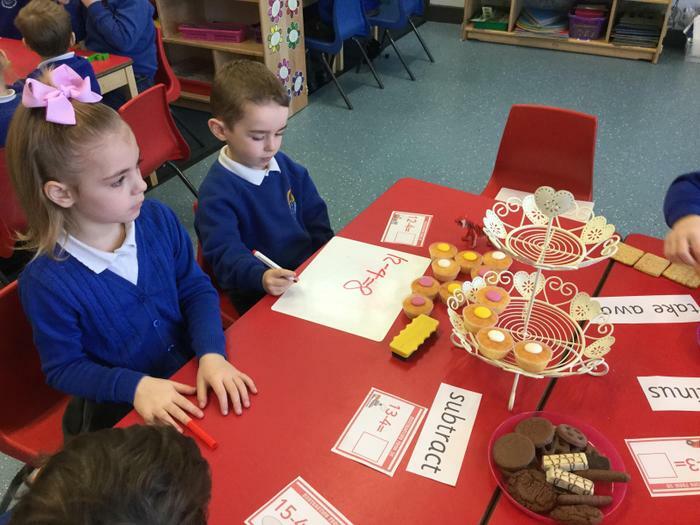 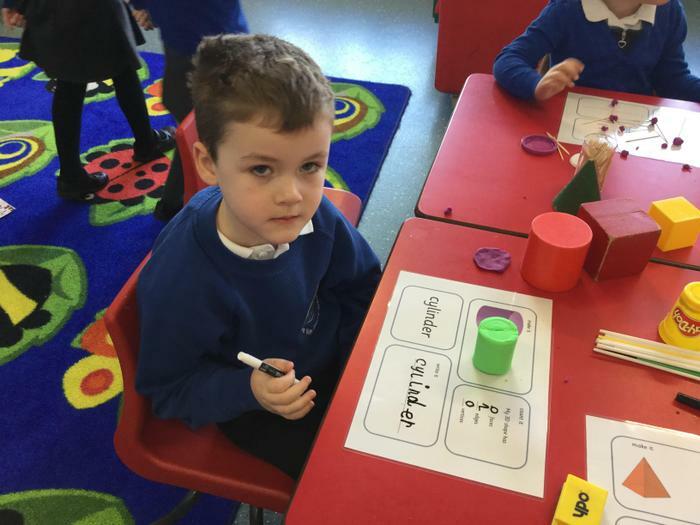 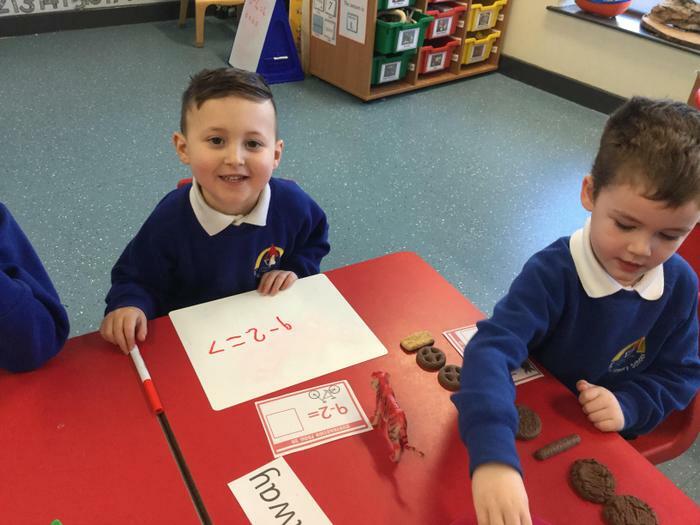 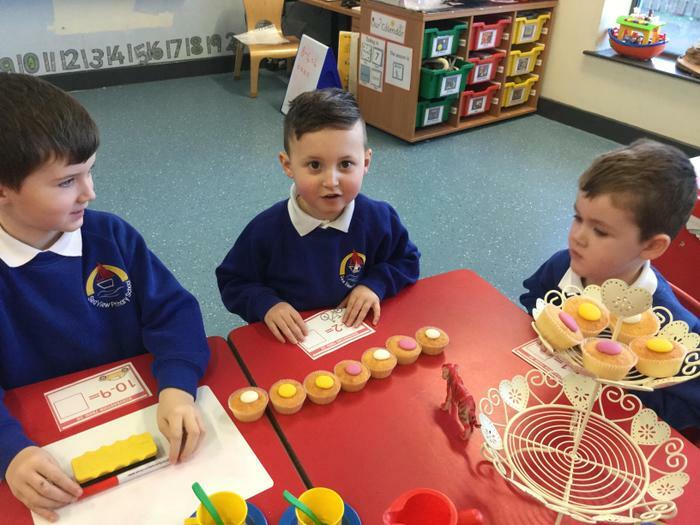 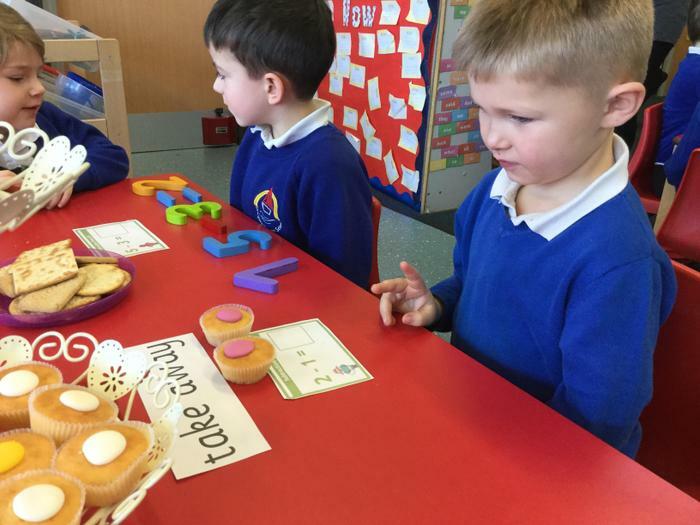 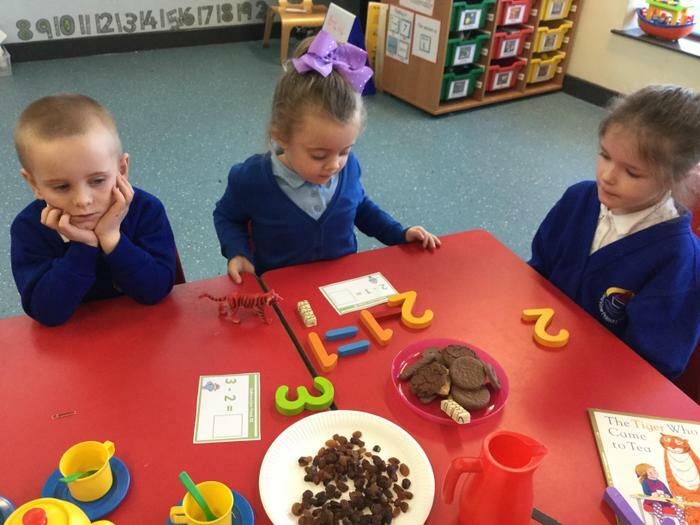 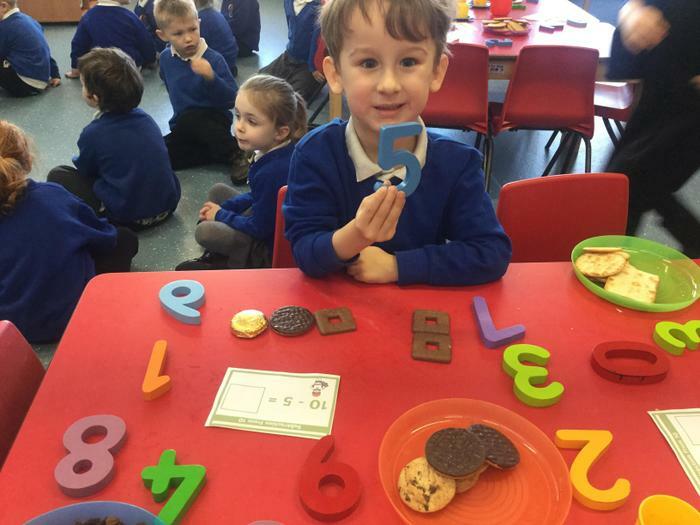 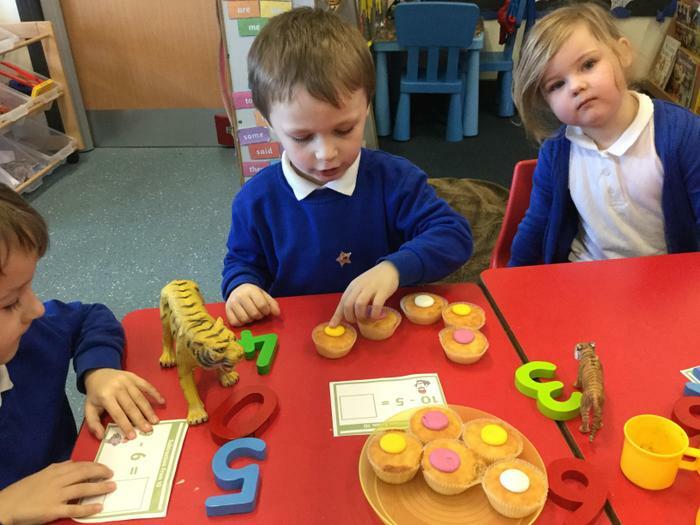 We have been learning to understand subtraction as taking away and solving subtraction number sentences When the Tiger Came To Tea and ate all of the food. 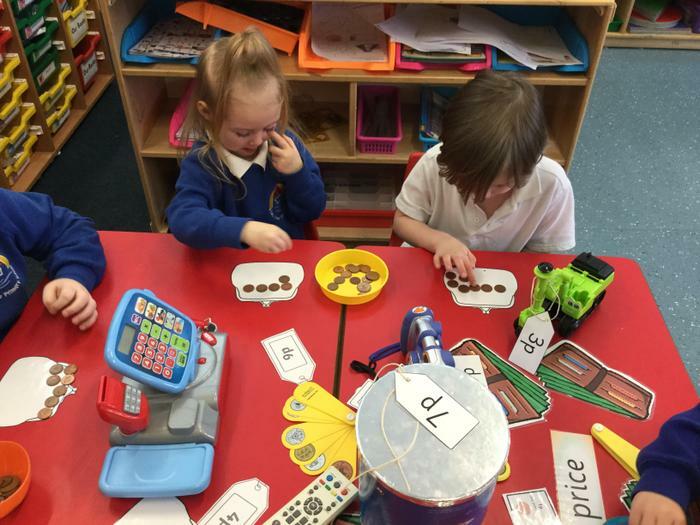 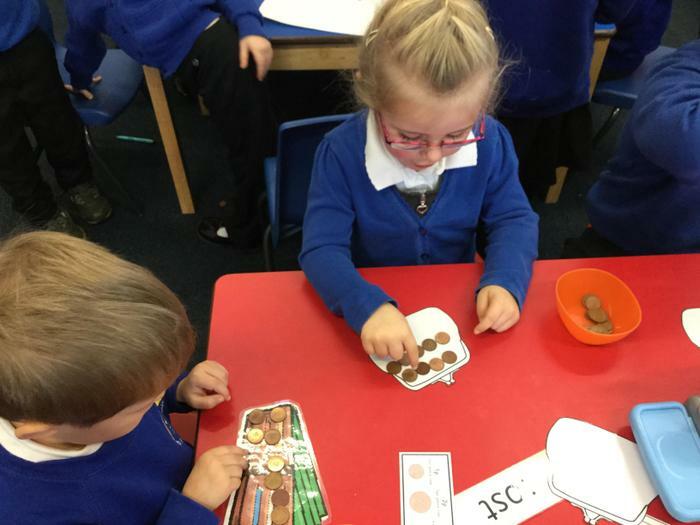 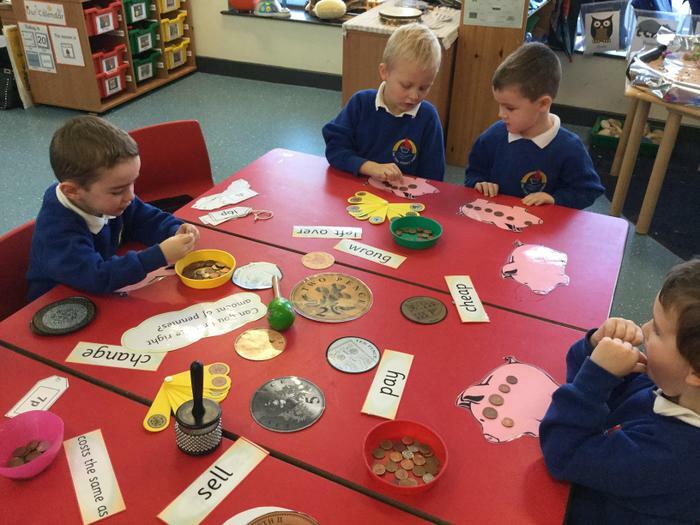 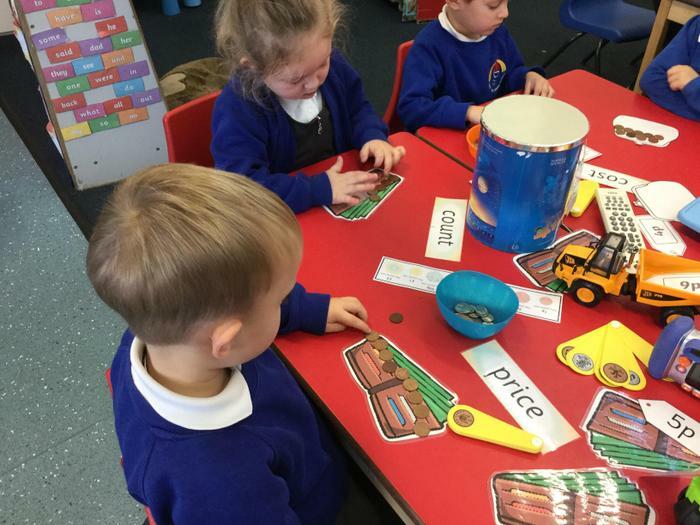 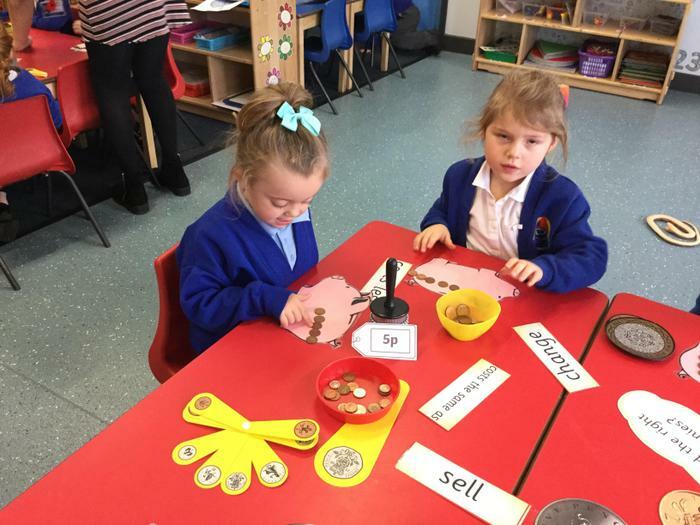 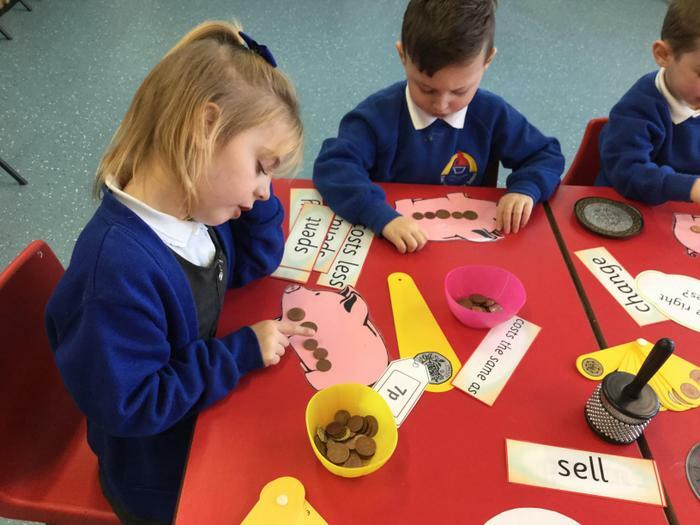 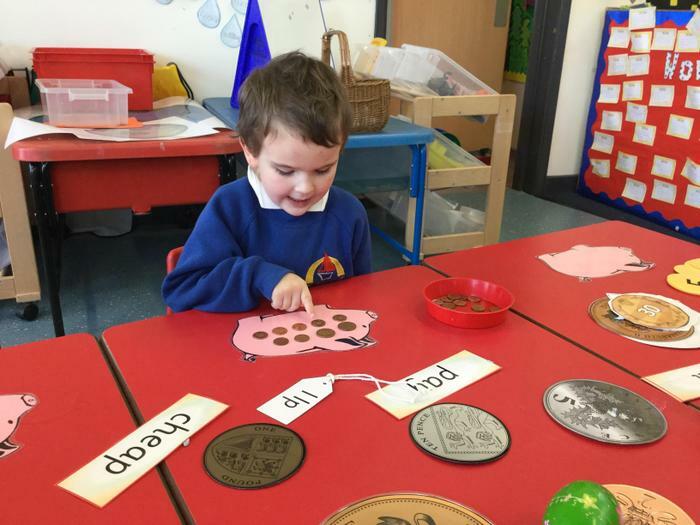 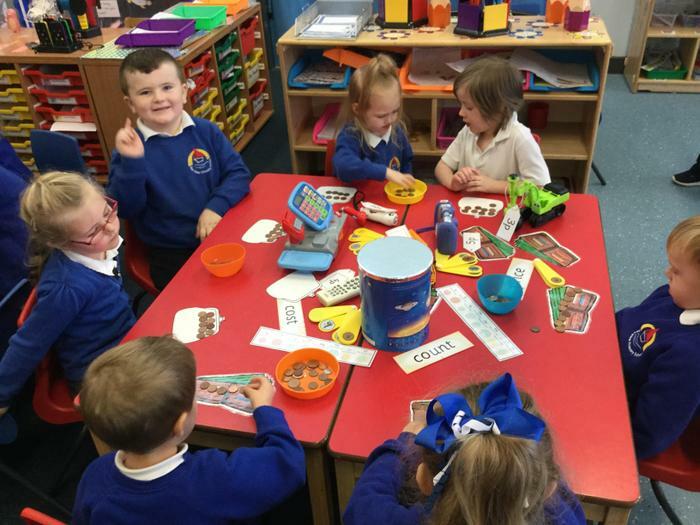 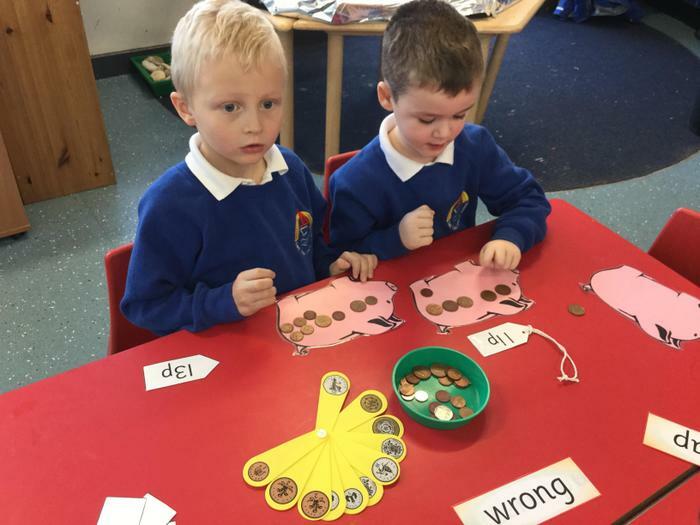 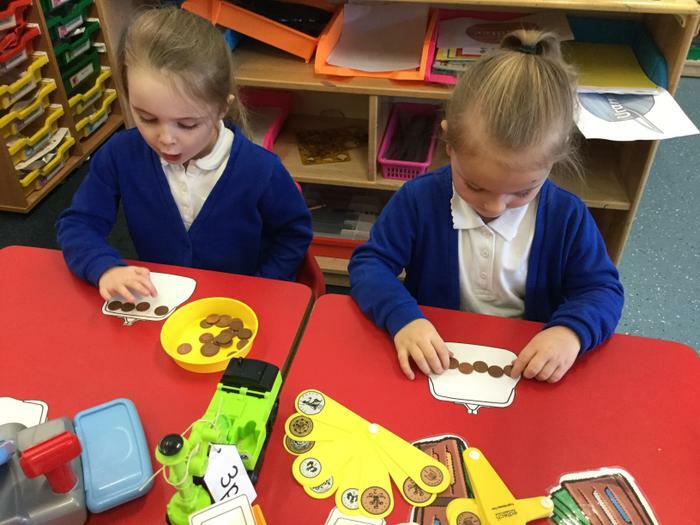 We are learning to recognise and use coins to pay for items at the Sea View Shop. 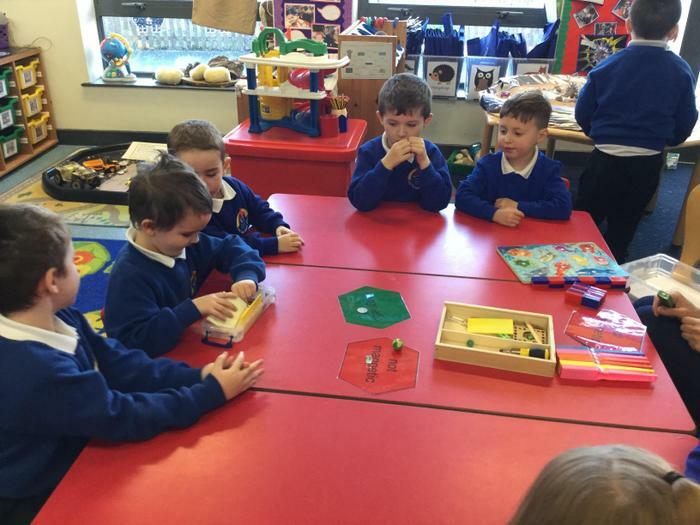 Why not practice at home on Top Marks Toy Shop money game. 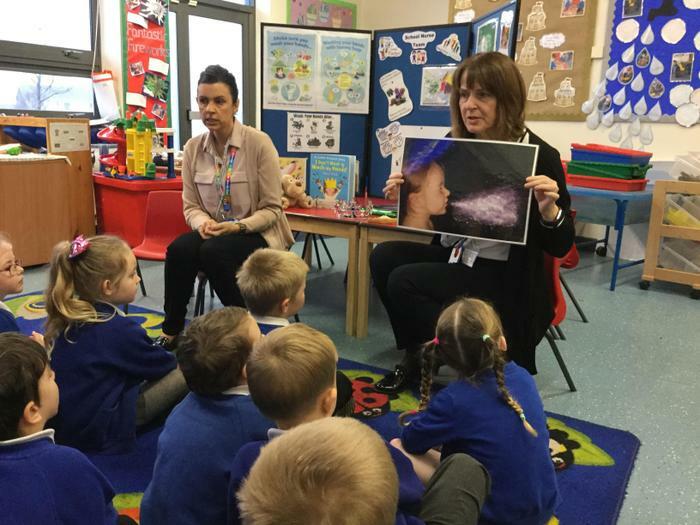 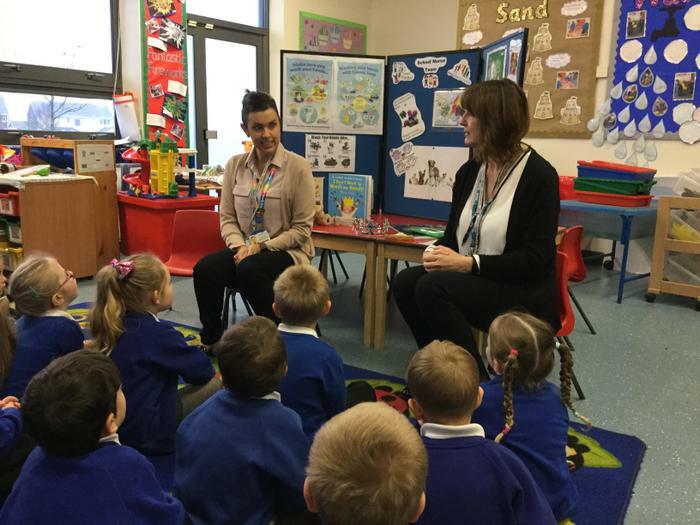 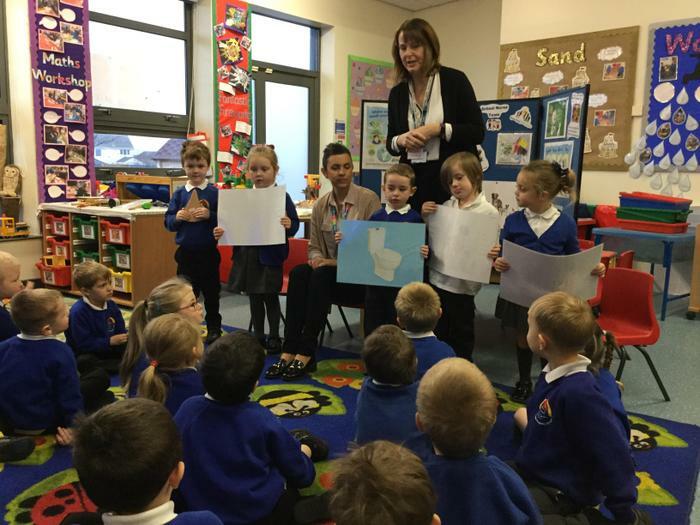 The school nurses came into Reception to show us how to wash our hands. 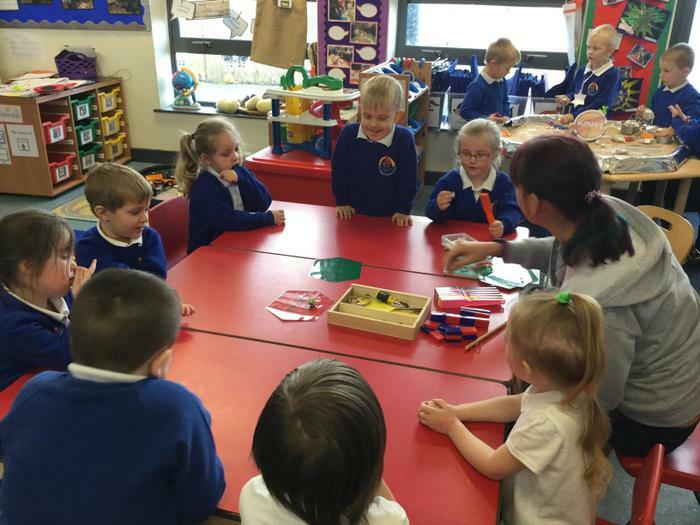 We discussed when we need to wash our hands throughout the day, listened to a story and learnt a song with actions to remind us. 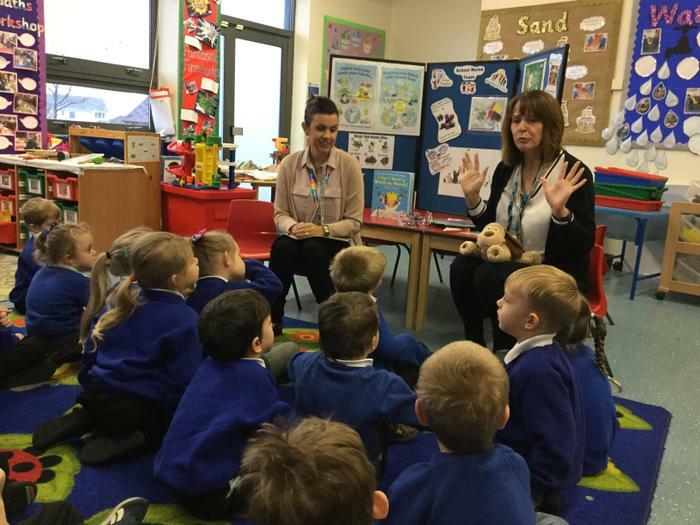 Why not ask your child to sing the song we learnt! 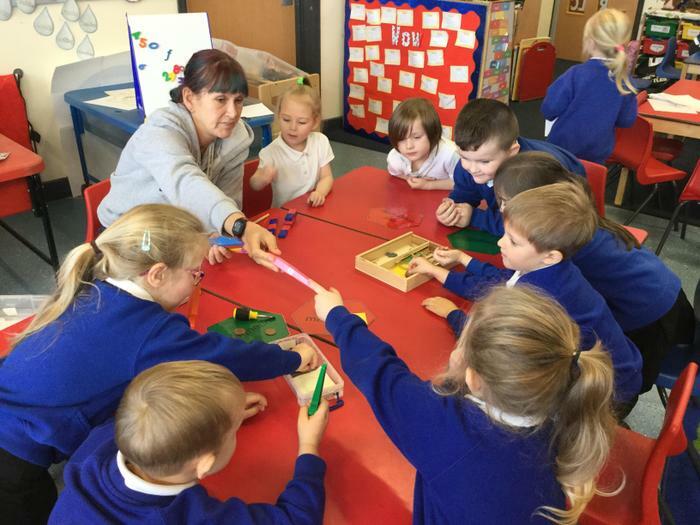 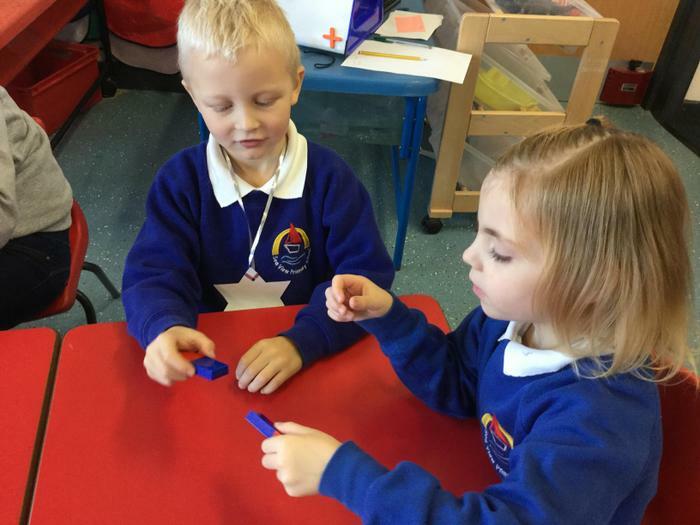 Magnet Workshop - We have been scientists for the morning and exploring what makes an object magnetic. 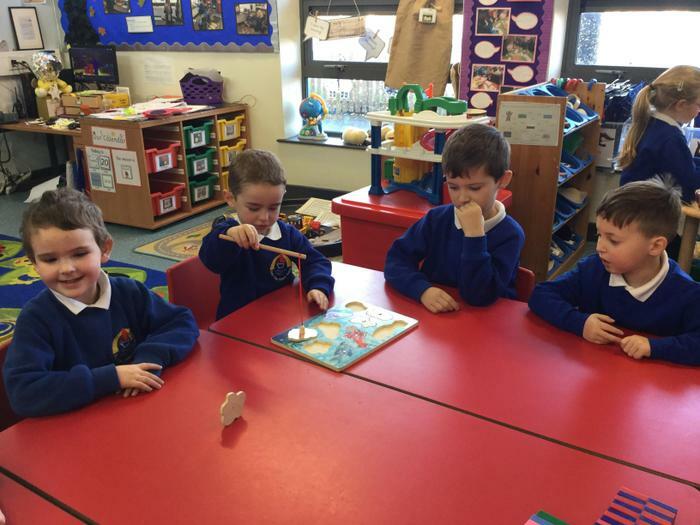 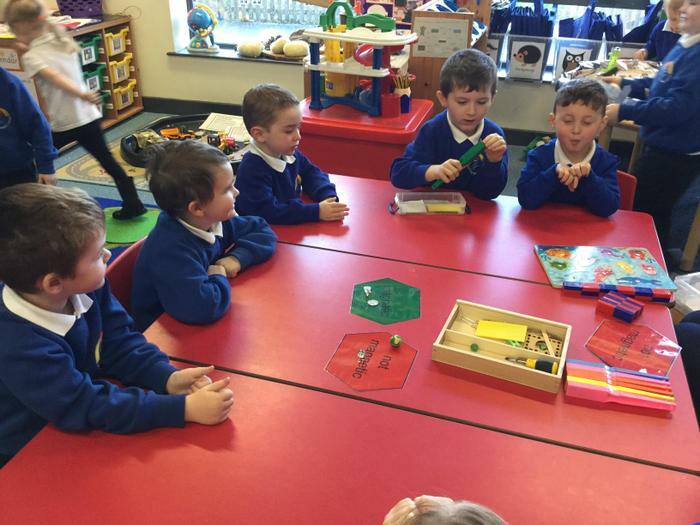 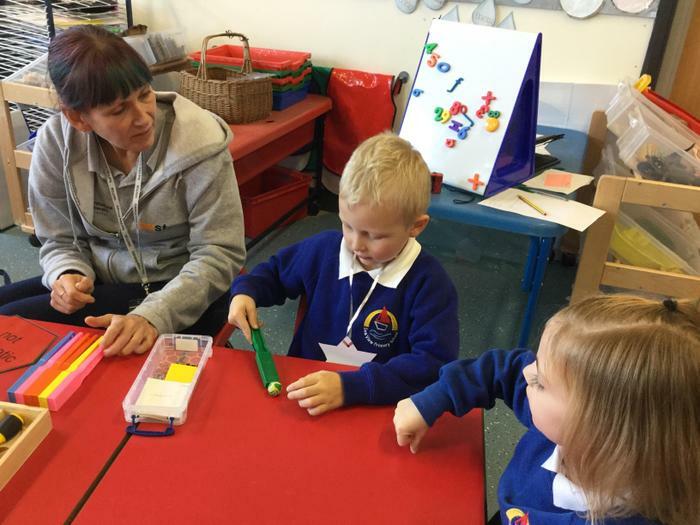 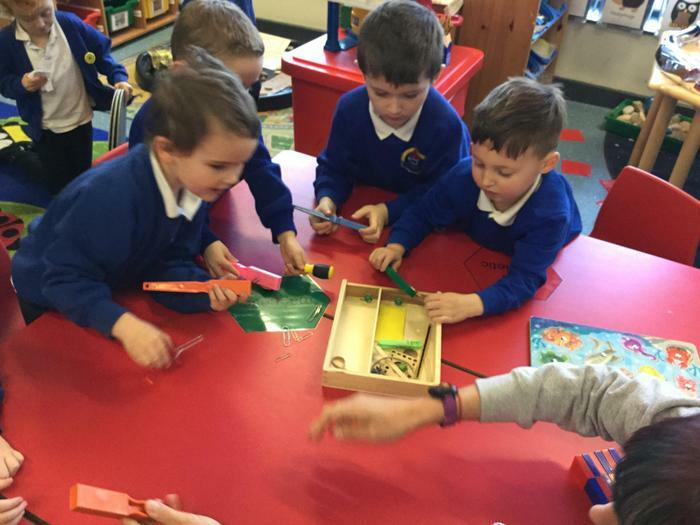 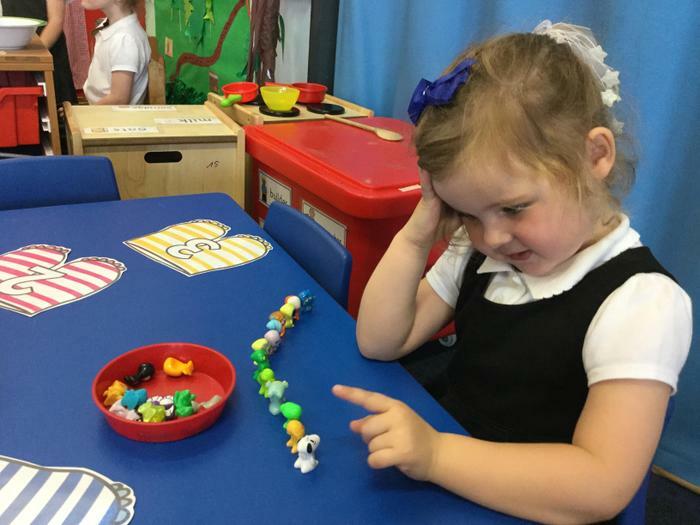 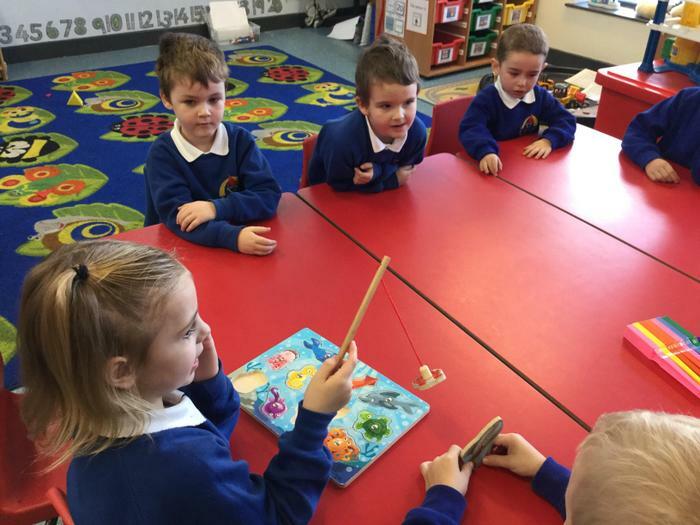 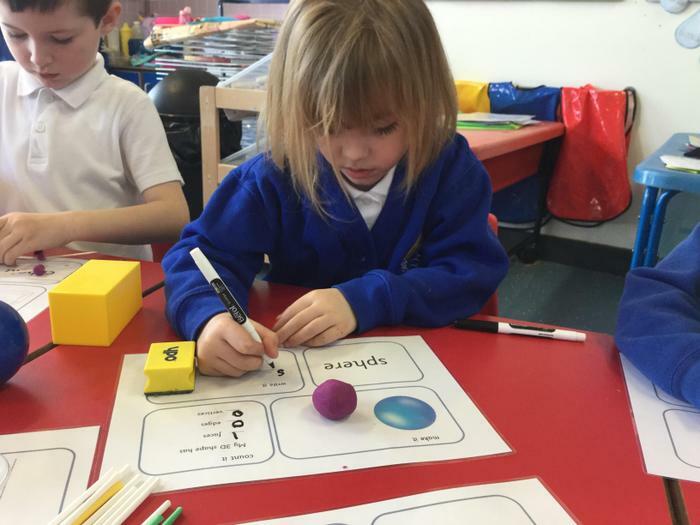 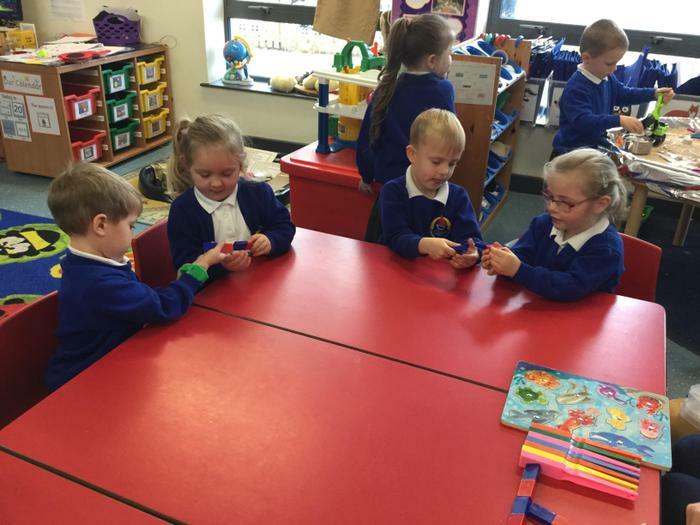 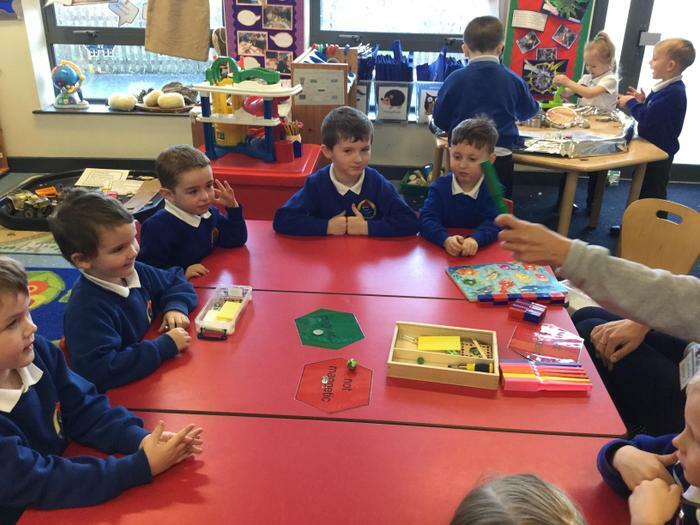 We have been making predictions and enjoyed sorting objects into magnetic and not magnetic. 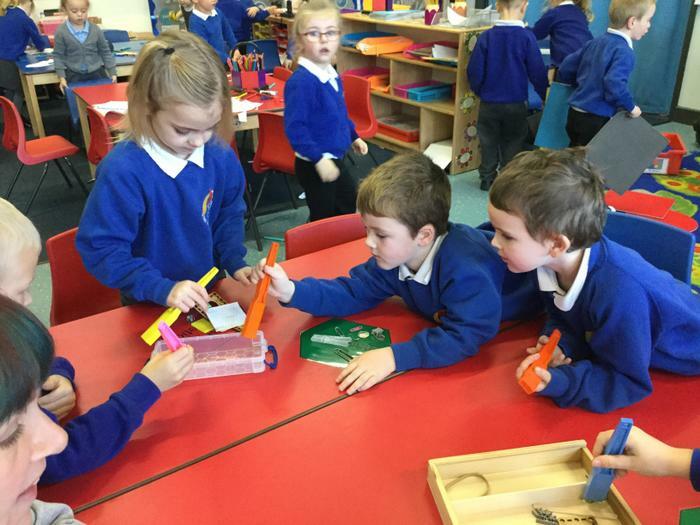 We tested objects that were made of wood, glass, metal and plastic. 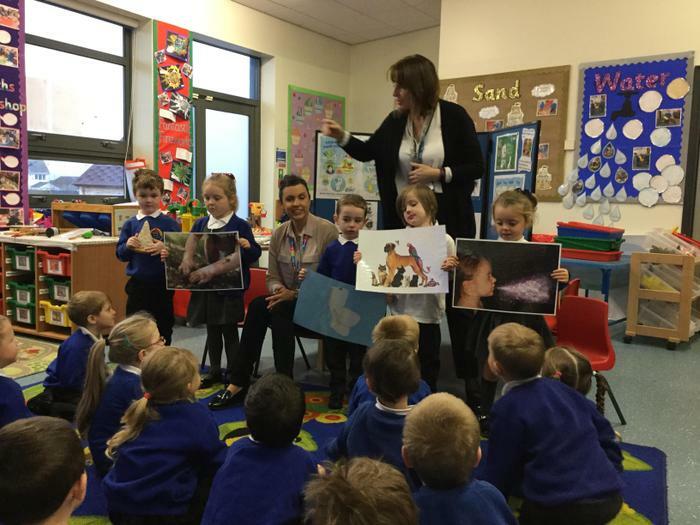 Retelling the story of Owl Babies. 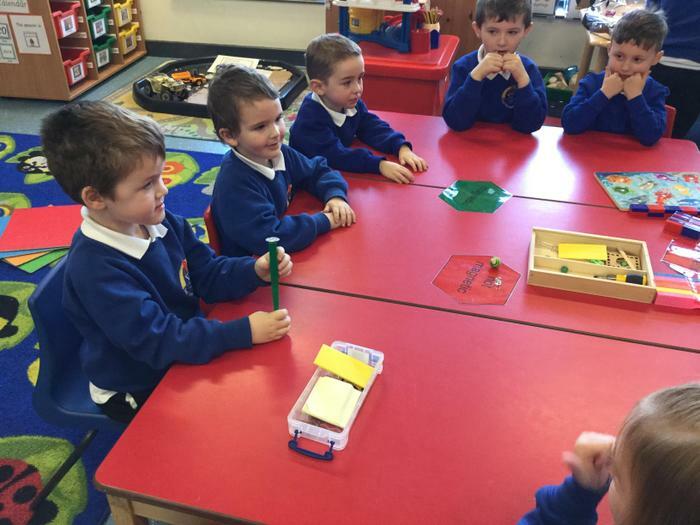 Recreating roles and re-enacting the story. 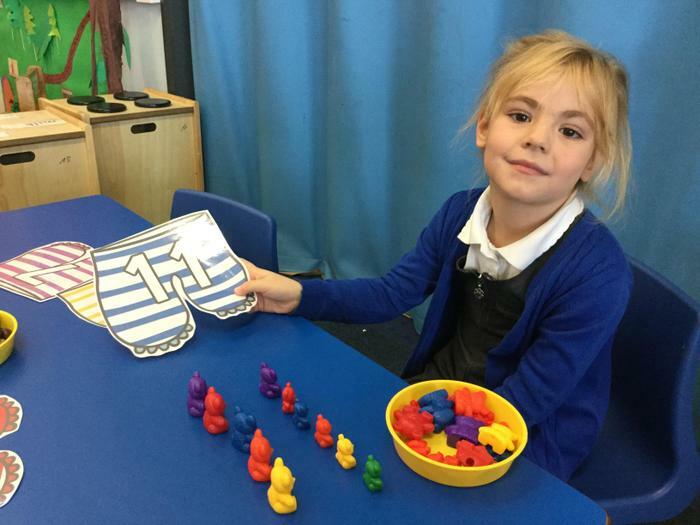 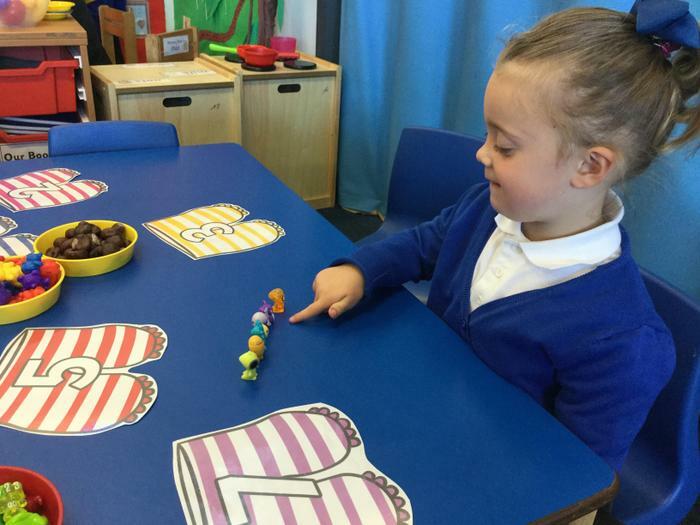 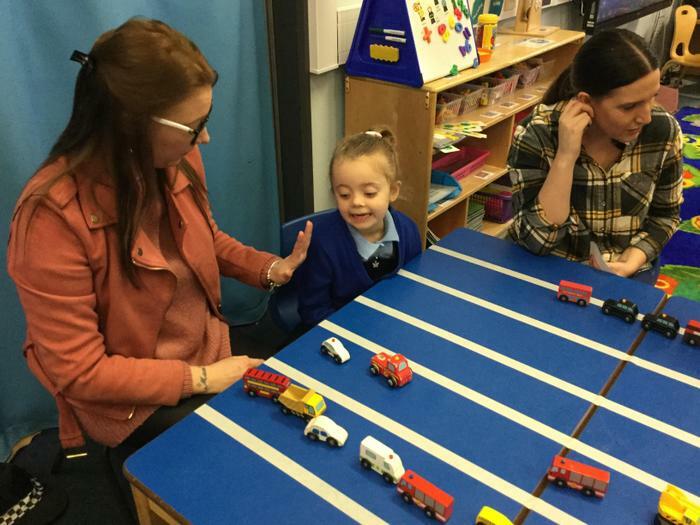 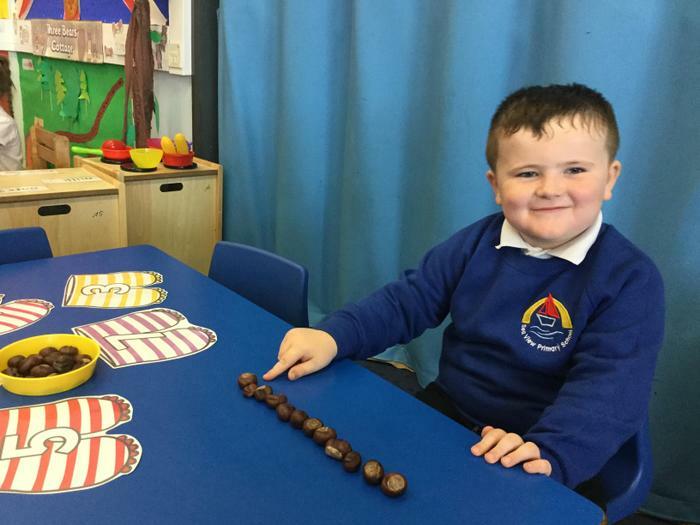 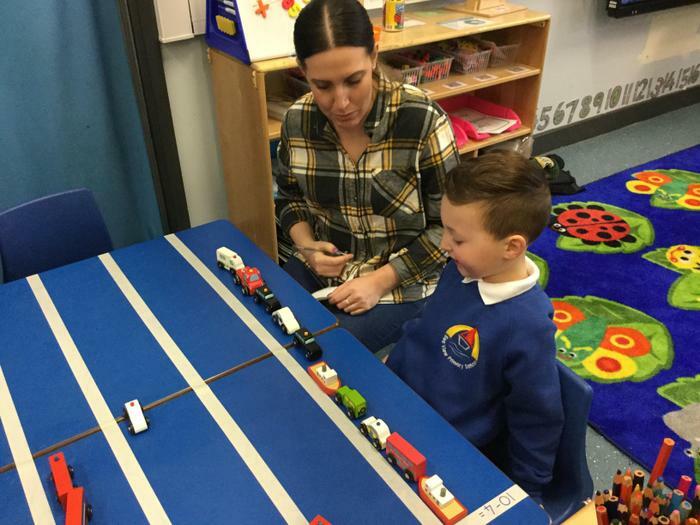 We have been counting in class looking at different ways to aid counting by lining them up, touching and moving them. 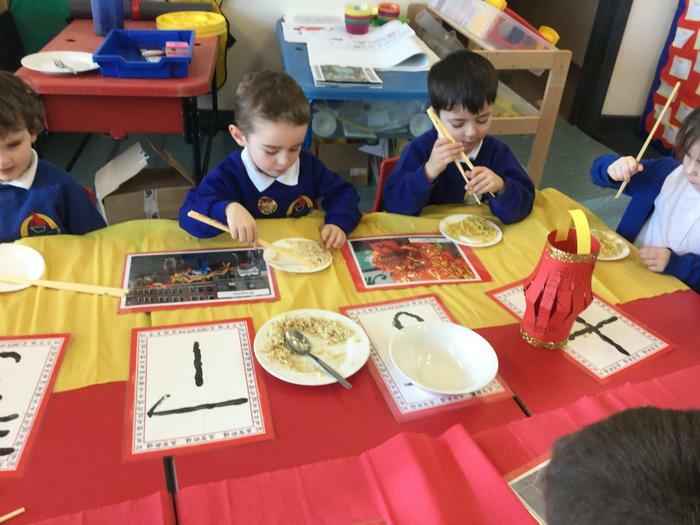 We have been creating leaf prints using Autumn colours we see around us. 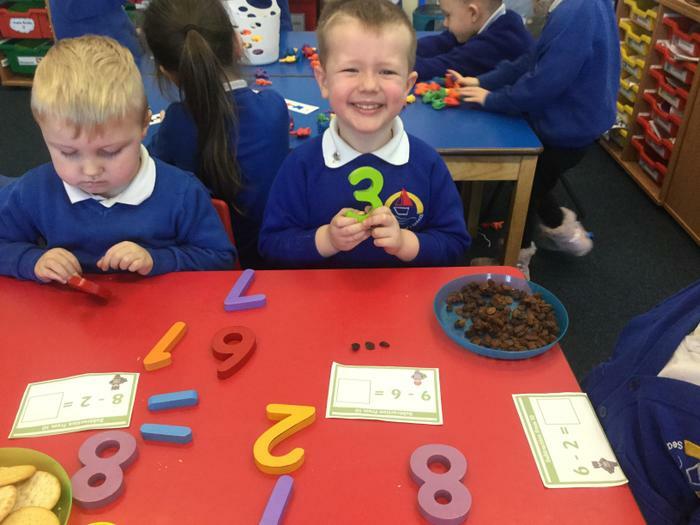 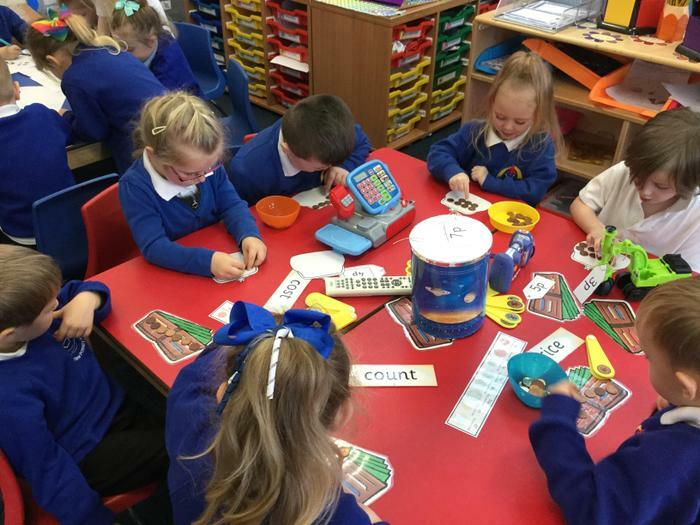 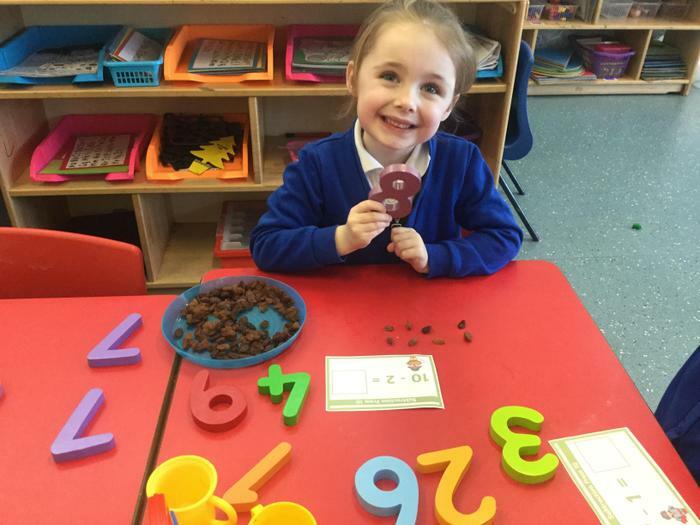 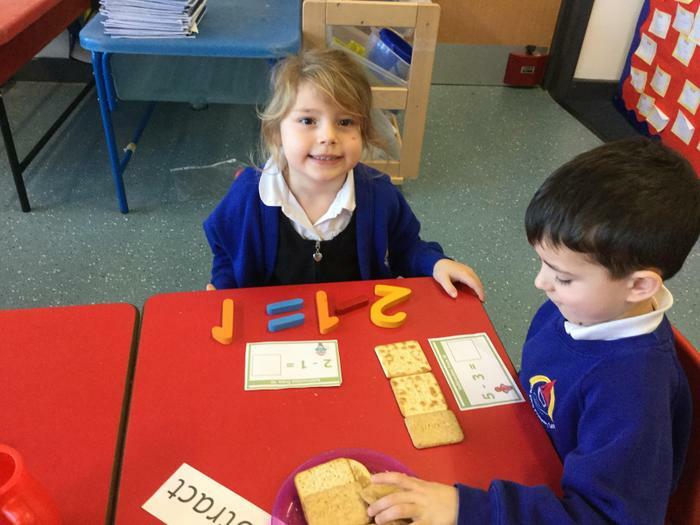 We are learning to sort letters and numbers to distinguish between them.